It is a huge bike standing 67cm c/t tall. I can just about ride it, and it´s not bad, I have to say. 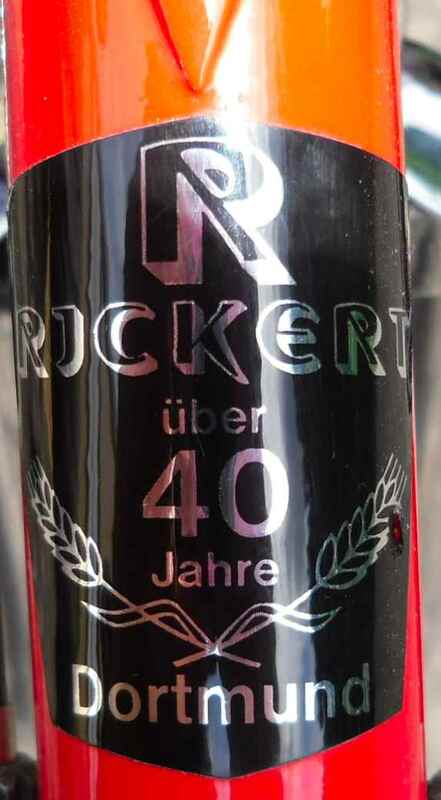 The frame has many more modern features than the Lüders, although the Lüders is a few years younger than the Rickert. 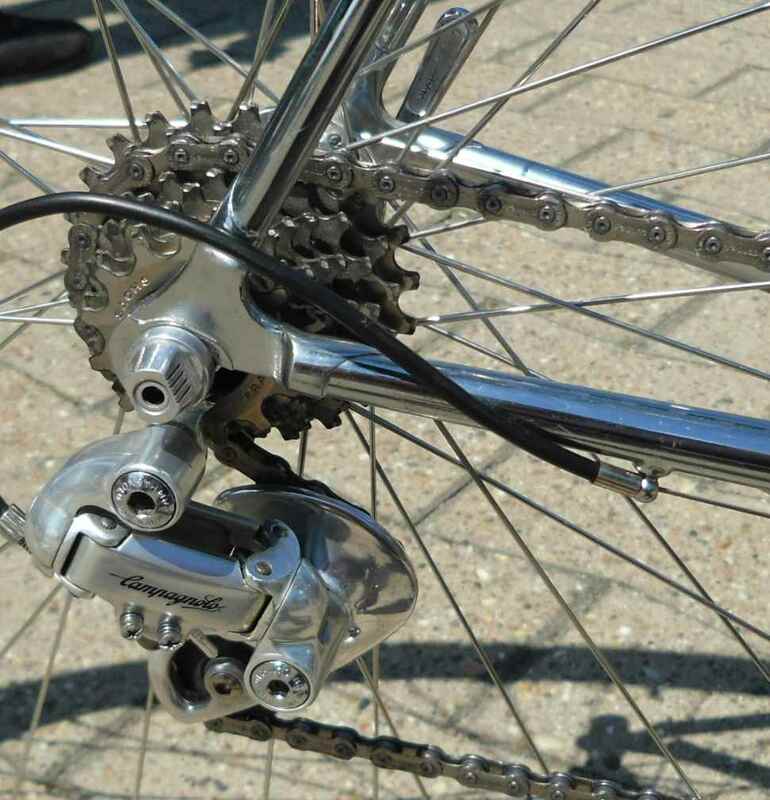 Both have 130mil rear dropout width, but the Rickert came with 8sp. 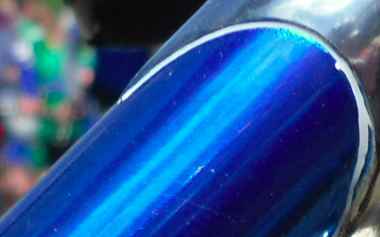 parts whereas the Lüders had the full (excepting the seatpin) Record Titanium 9sp. groupset fitted, so I can´t imagine the Lüders frame having been built to a budget. 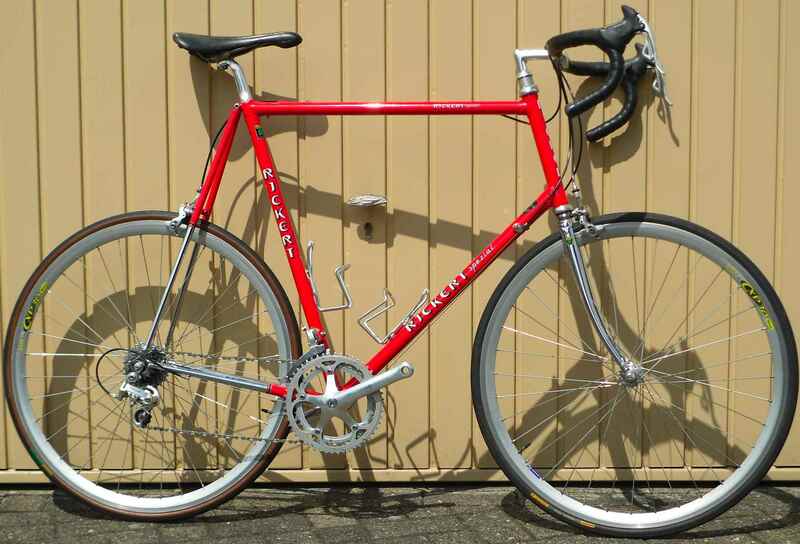 The Rickert is that tall that the first owner chose to have no head transfer fitted but another seat tube one. Looks very odd indeed. These transfers came in sheets (as they often do), so Rickert must have sacrificed a second one. Björn Ostrowski of NRW-Klassiker.de kindly sent me one for which I´m very grateful. 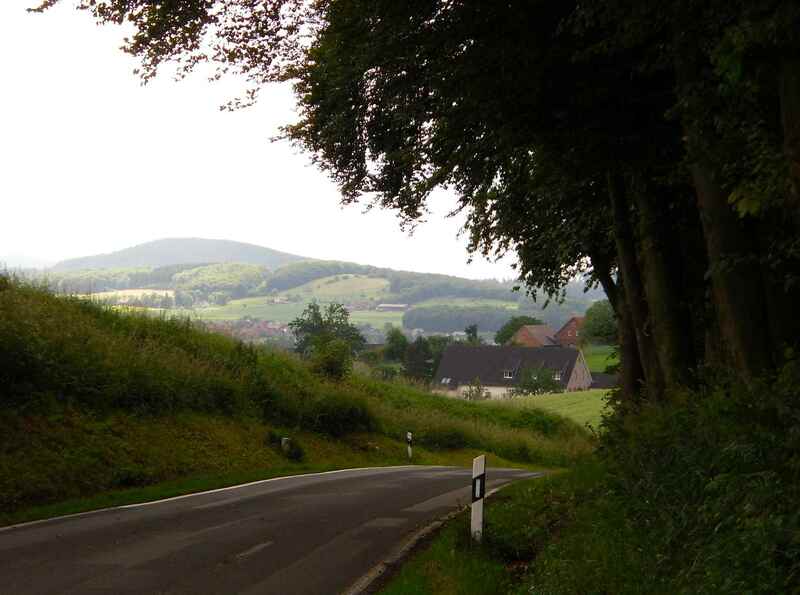 BTW, his webpage is developing into a fascinating resource of German cycling. 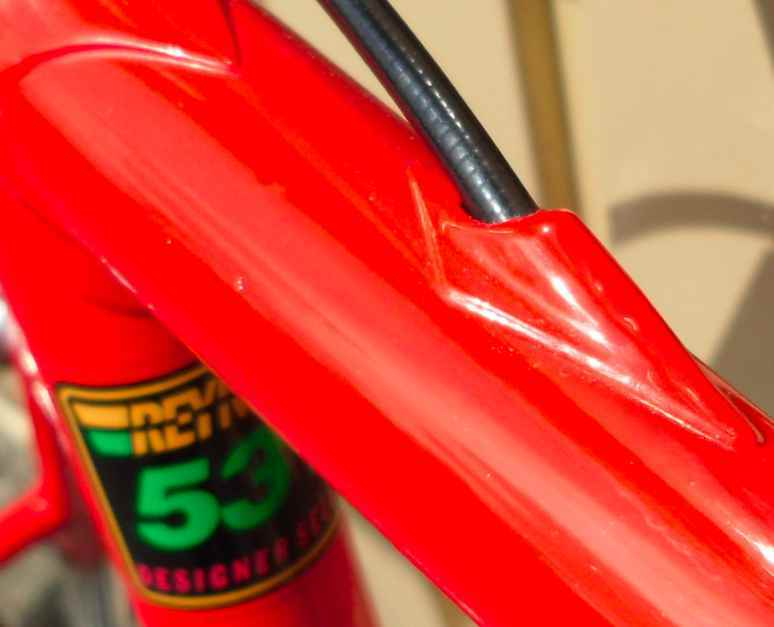 The “designer select” privilege meant that the builder was able to make a choice from several different frame tube sets. 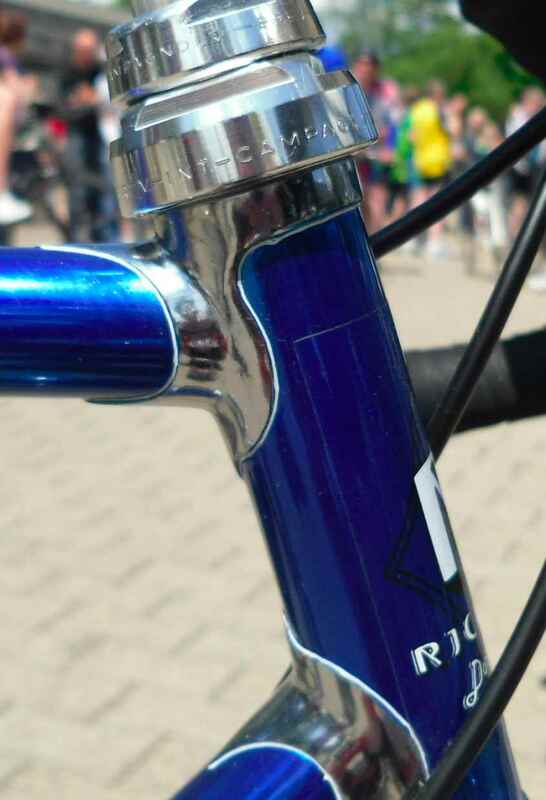 In this case Rickert will have chosen tandem rear triangle tubes, and certainly an oversized diameter top tube. The bike´s first owner said that Rickert fabricated some of the lugs himself. The frame has other specialities. 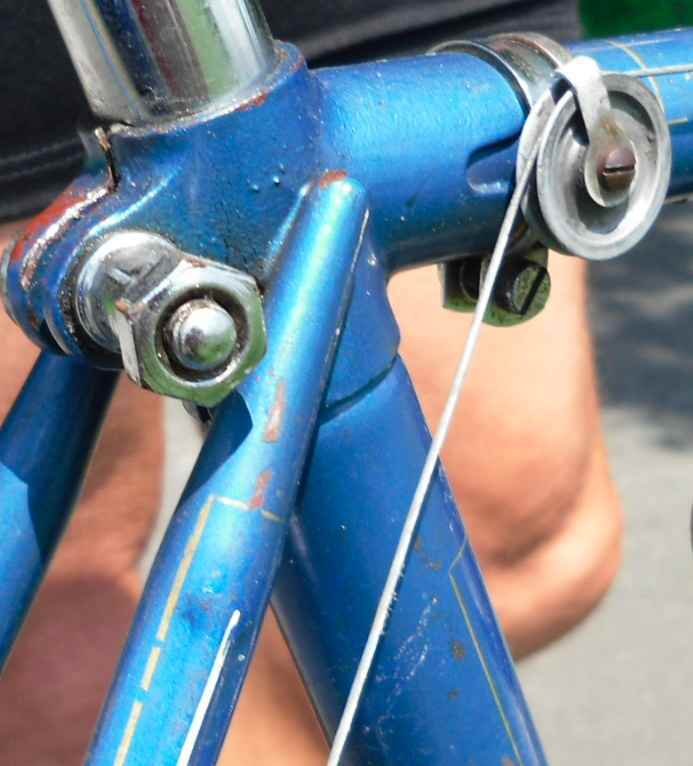 There is the typical Rickert way of strengthening the chainstays. I´m a bit doubtful if it really makes all that much of a difference. 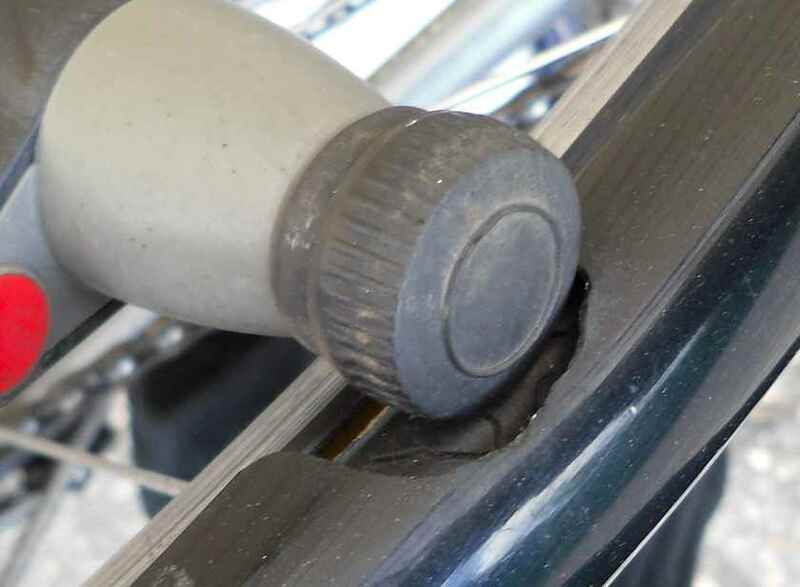 If you look closely you can just about discern an oval plate brazed under each seatstay just aft of the bridge. The things are rather hard to photograph. It looks like a larger Italian fork crown tang. 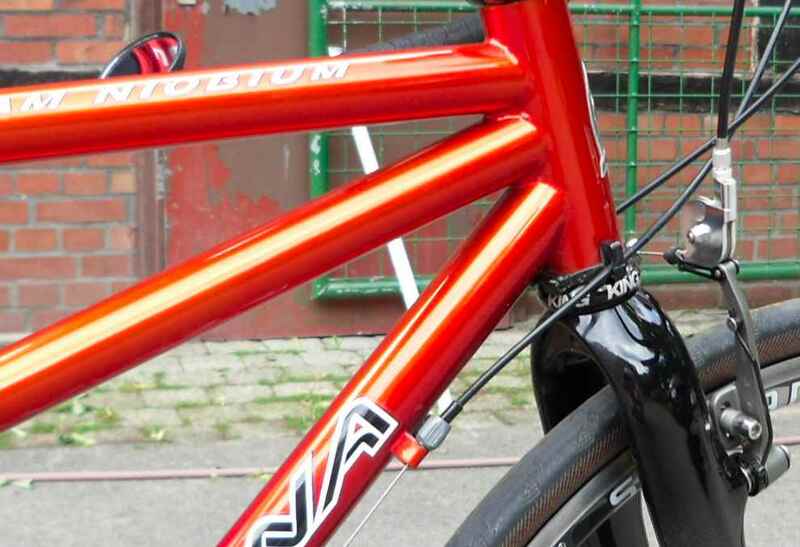 It´s too wide to be that; it also must have been made special for this bike. The seat cluster is also way better constructed than the simple solution found on the Lüders. 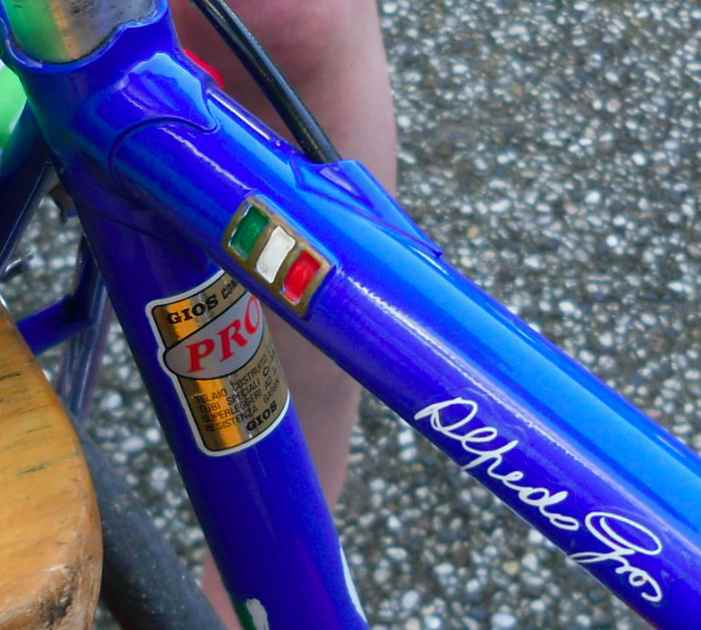 Note the thinned seat lug tip on top of the top tube. Lüders of course had his own seat stay tips with the engraved horse; maybe that made a difference. This also is a feature which is lacking on the Lüders. Now over to the vast expanses of chrome. 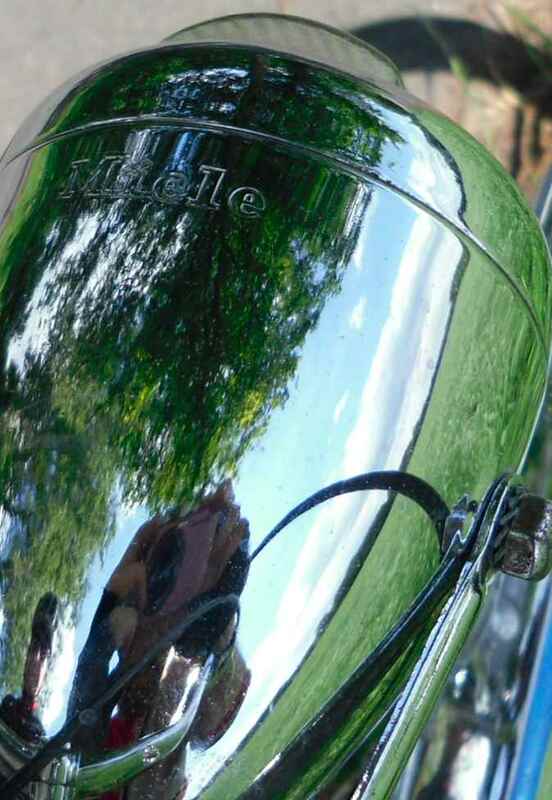 Surely chrome could have been ordered on the Lüders, so that´s just something the first Rickert owner splashed out on whereas the first Lüders owner chose not to. … and some of the works at the rear. 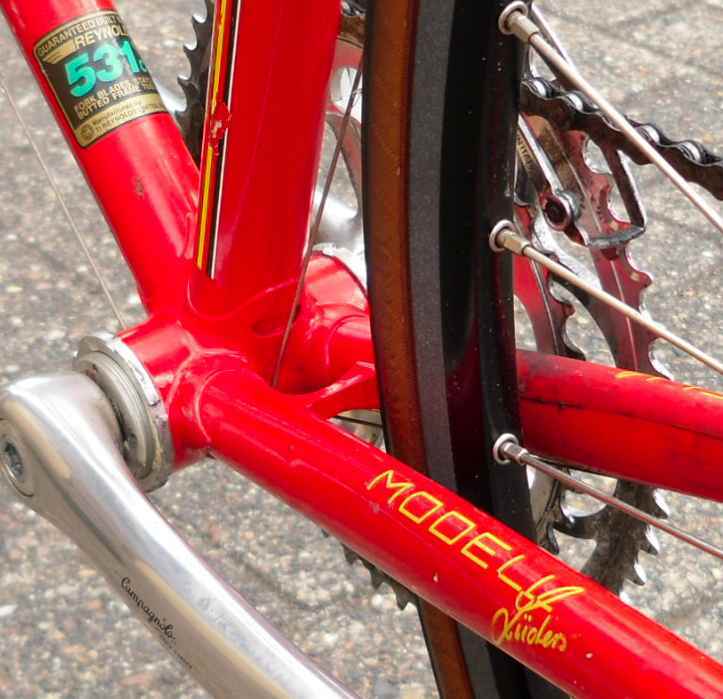 Note the modern rear dropouts. Same system at the front. 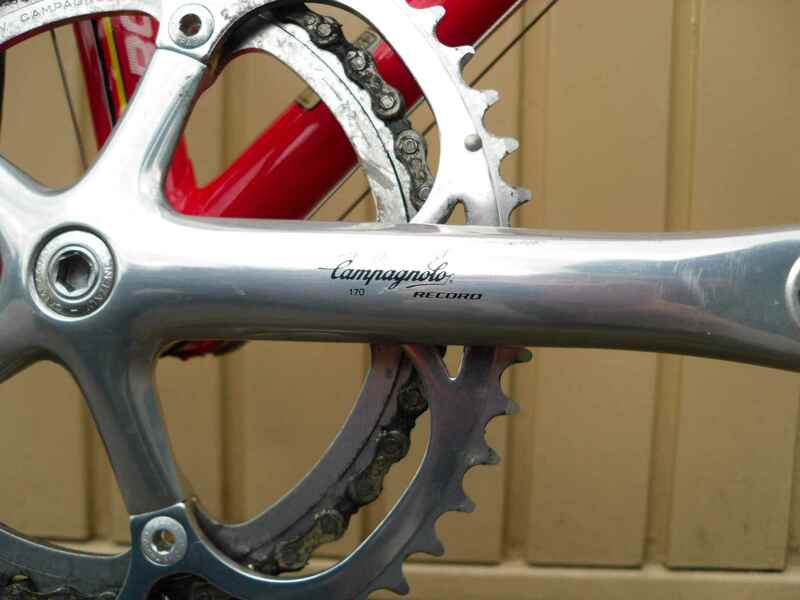 Lüders still used standard Campag ones. Two more parts from the groupset. Not much leeway for changing chainwheel size here. And that´s it for today. I really need to get this off my chest. The weather is horrible now, I have already taken the grey Columbus monster and the yellow Lüders to bits, and so here we go again. Three posts in a day. At what point does addiction start? This is a ca. 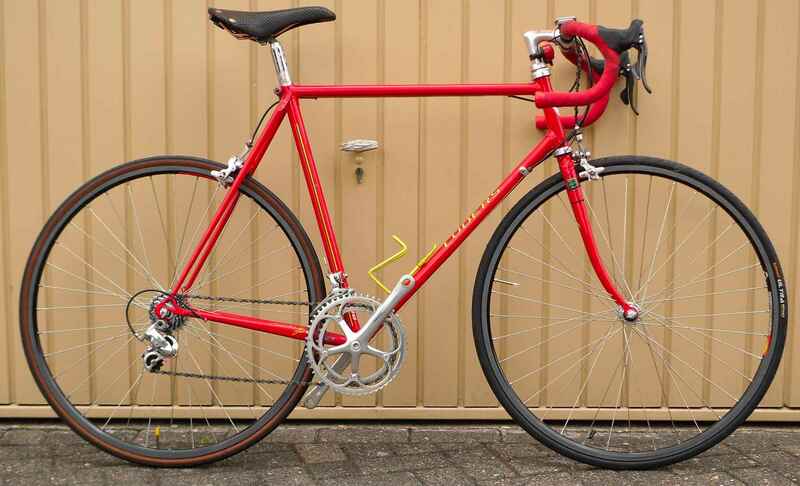 1990 Lüders from Berlin kitted out with a Record 9sp groupset, or what I hope will become one eventually. 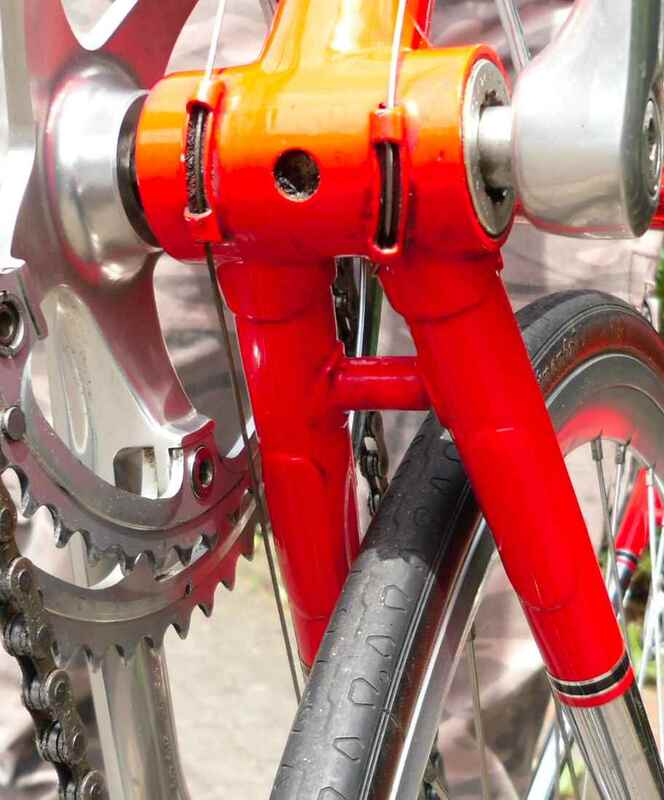 I bought the bike last week for spares but then decided it was worth keeping, at least until I find out how much/how rare 27.2mil Record titanium seatpins and the correct pedals are. Else, I could use some Record 9sp. 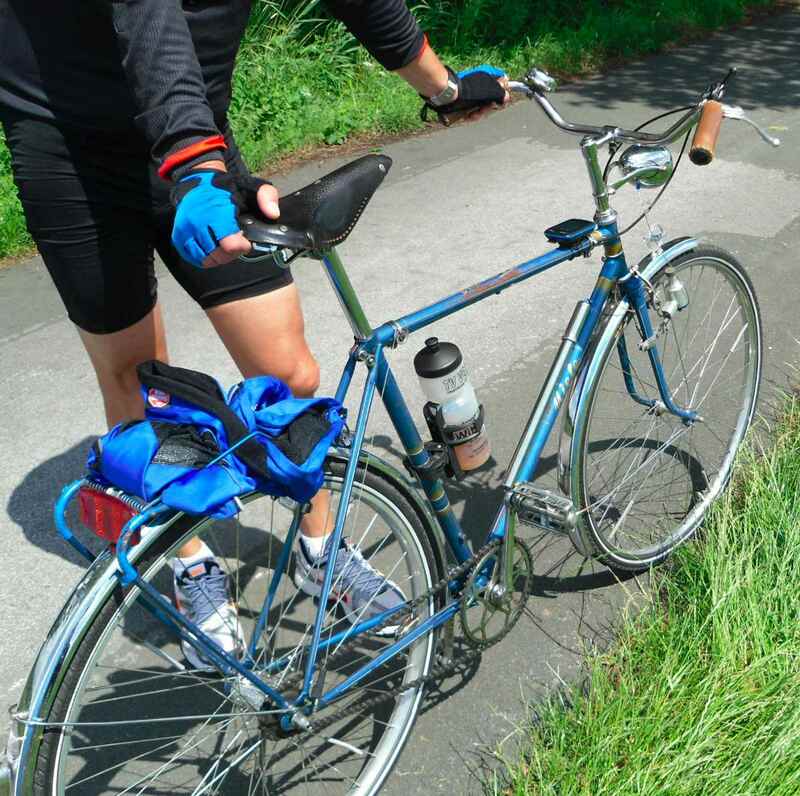 bits quite well on my Randonneur (carbon brifters…). 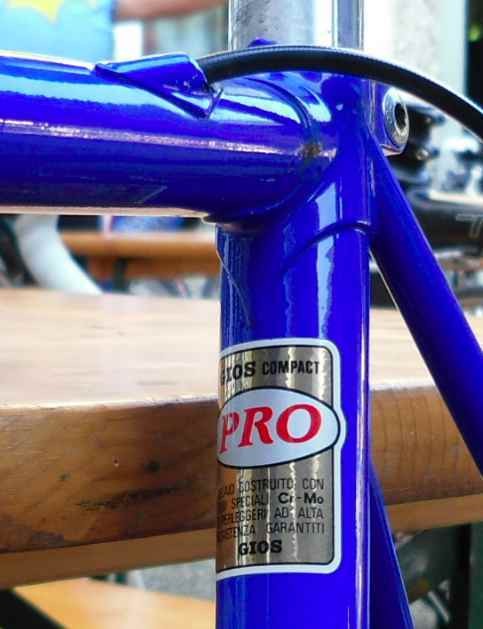 I had an email from the people who continue Lüders´ shop in Berlin, and all they know is that the last two figures in Lüders frame numbers tell the year in which the frame was built, so this one is 1990.
is the period correct part. 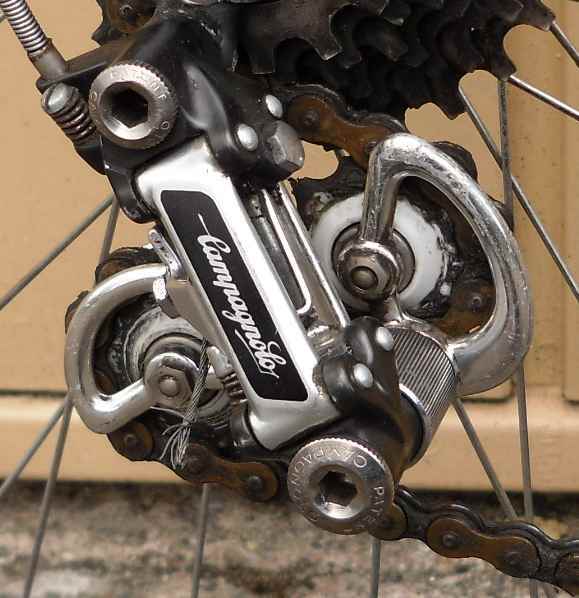 Need to look it up on the Campag catalogue website. The Lüders is about six years older and supposedly the same quality point as the Rickert I hope to post soon, but the Rickert has a much better finish and build quality. I need to have my son ride the Lüders as it much too small for me. He will then be able to tell me if it rides as ghastly as it looks. Substandard is an understatement here. OTOH there are nice spots. 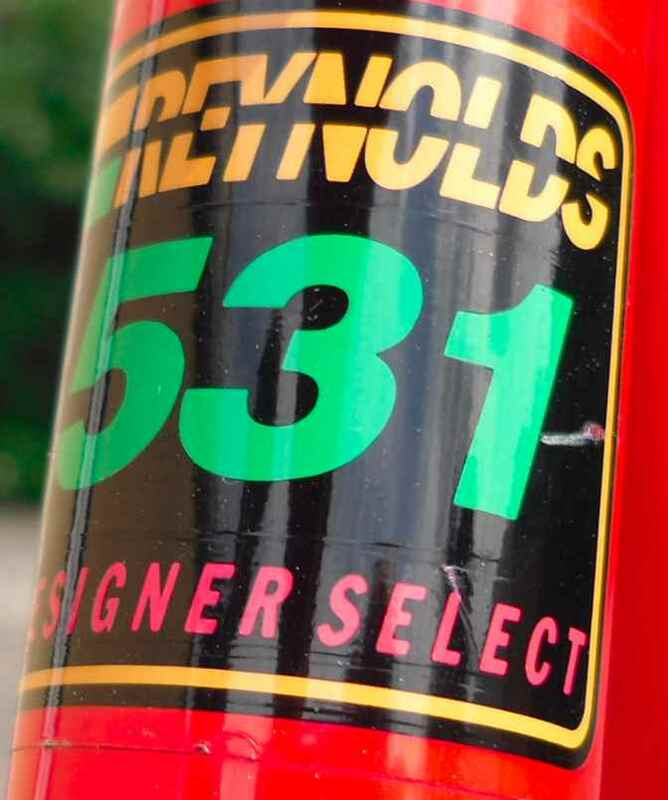 What I like is the Reynolds sticker on the down tube just above the bottom bracket. This seems to be a Lüders signature feature as te other one has it too. Also someone sold the last owner an Edco b/b bearing cartridge with a too wide body. Also I wonder what a Lüders bike, Modell Lüders (Lüders type), can be. Either it´s a joke which I have stopped finding funny after my second Lüders, or… well, whatever. Modell Profi (Pro type), Modell Galibier, Modell Record – but a Lüders Modell Lüders sounds silly. I don´t know where the titanium seatpin went; possibly there never was one. What I do know is that I dislike the lever. 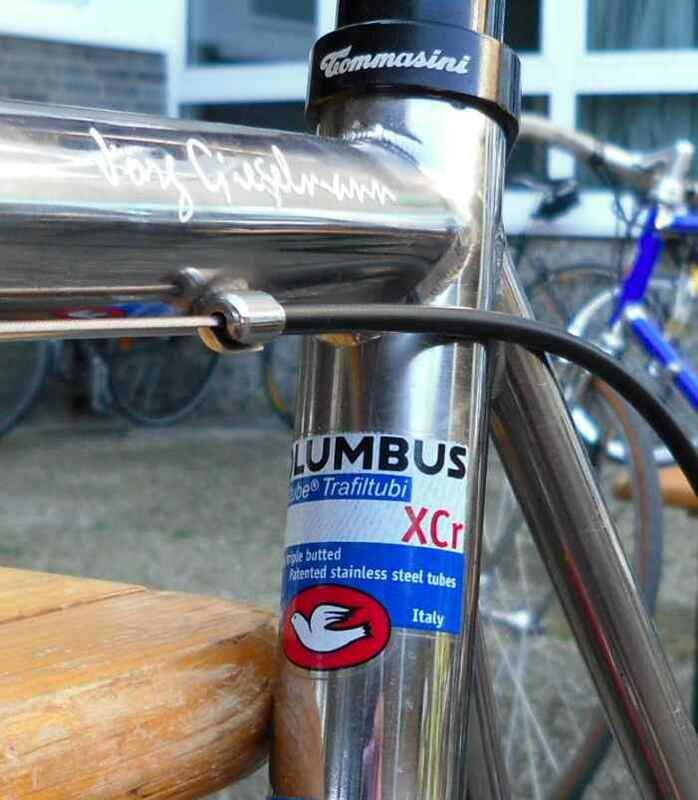 The correct Campag item came off the Columbus monster, so in this area all is well now. This snap shows three things: Firstly why there was the horrible lever for seat height adjustment, secondly that the extension was re-used, and thirdly it explains the many nicks and scratches in the paint. 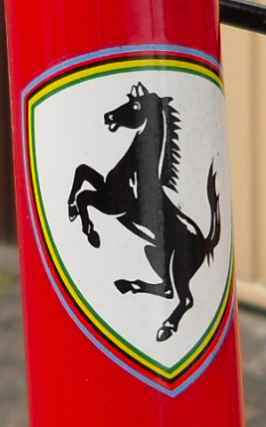 When I first viewed the bike it had a number of those Mallorca holidays stickers, removed by the cycle dealer I bought the bike off. The paintwork must have suffered in transit. 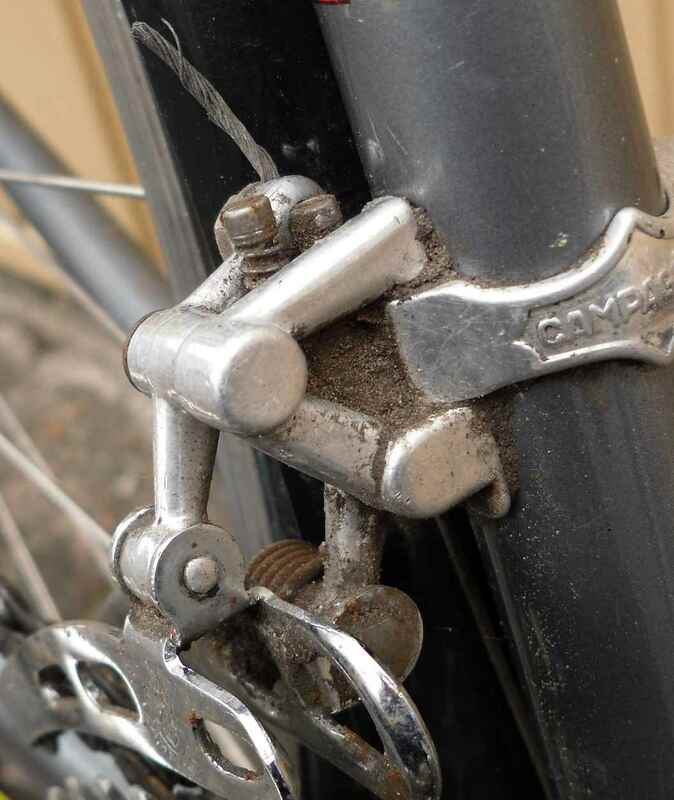 The lever facilitated transport, and the extension must have survived the changeover from whatever was on the frame originally to Record Titanium in 1999. The red one now has a rear width of 130mm, the yellow one of 126. 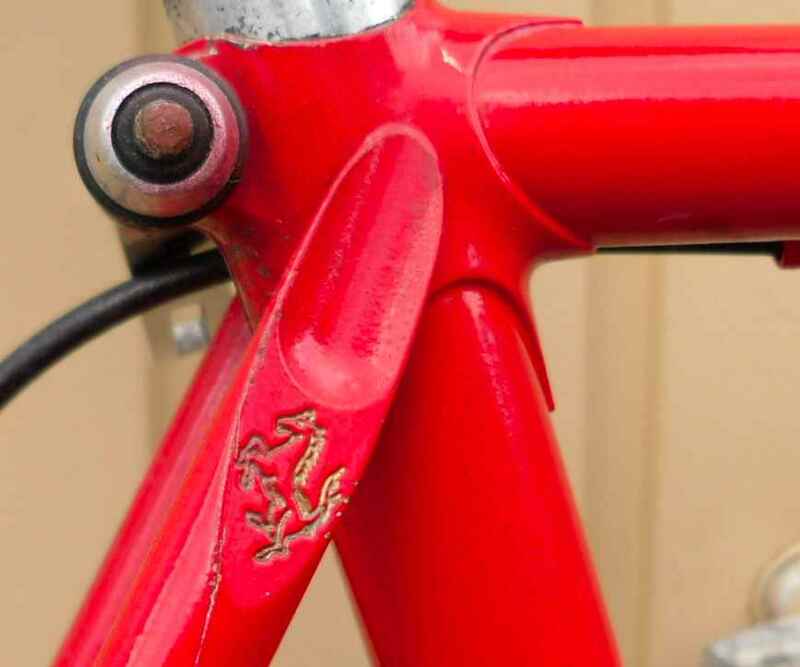 As the frame numbers show that the yellow one is one yer younger than the red one, the red one must have had its rear dropout width widened when it got the new Titanium groupset in ca. 1999.
here. I think that even for 199o the frame is of a rather conservative construction. Rickert had advanced beyond this. Again, note the quality of the paintwork. OK, what will prevail? My curiosity to try out some of the Record equipment on the Randonneur or the idea to try and assemble a complete Record 9sp. 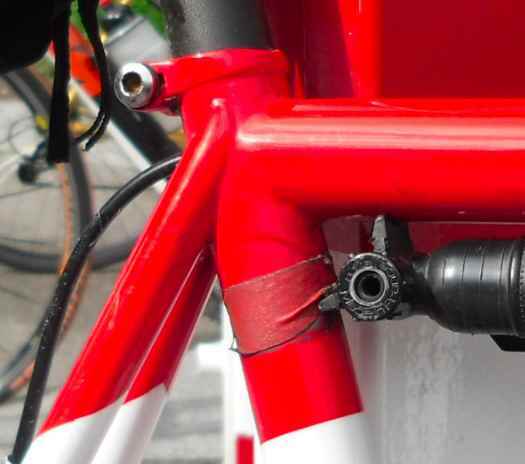 groupset to gloat over and guard for posterity? Not clear yet. While I´m writing this, I should really be riding, but – excepting one occurrence – this is a fitting ending to a mostly horrible week, bike wise, anyway, during which I was hampered by a number of things. To start with, all hell broke lose at work keeping me from posting all week long although I had promised some people to publish some photos. This I have finally managed this morning. Yesterday night the weather forecast was heavy rain for today, high winds, and while we´re not deterred by most bad weather coditions, this did put us off. Accordingly I didn´t set the alarm clock, and woke up to no rain, even a little sun, but too late to make it to the start of today´s ride, nice and hilly, in a town about 50km away. But worst of all, I disassembled a bike yesterday evening which was among the most horrible I´ve seen. I earned some money, never full time I admit, in the past, repairing bikes, and have seen “repairs” executed by some hamfisted owners, but usually I just told them to throw the bikes out and get a new cheapo, which I could supply in many cases. 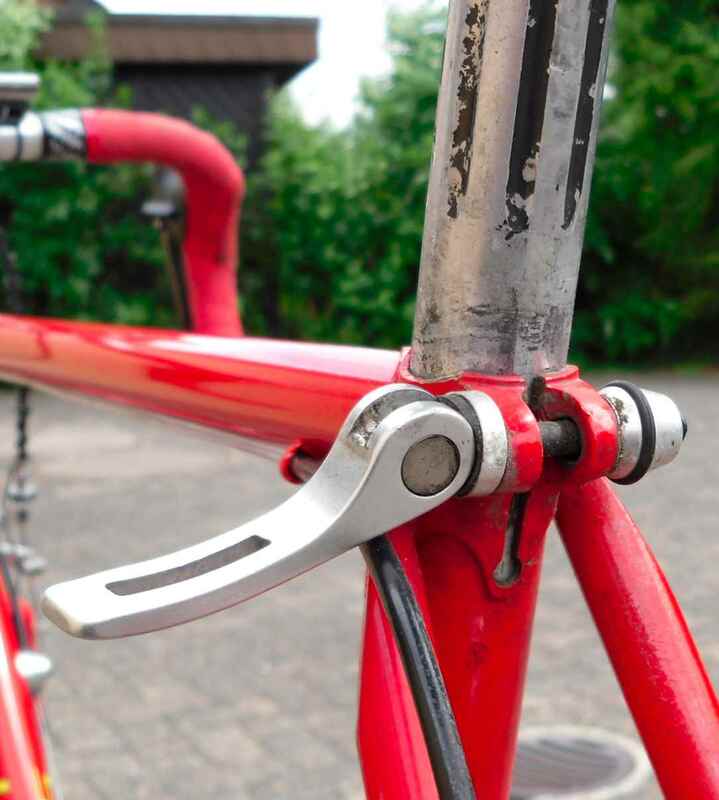 Last week, Thursday, I was able to get my hands on something I had coveted for a long time, namely a frame built by what I had thought to be Berlin´s equivalent of Dortmund´s Rickert, a frame builder called Lüders. As it turned out my two Lüders at least are nowhere near as nice as my Rickerts, but it wasn´t the right week to expect anything great happening. 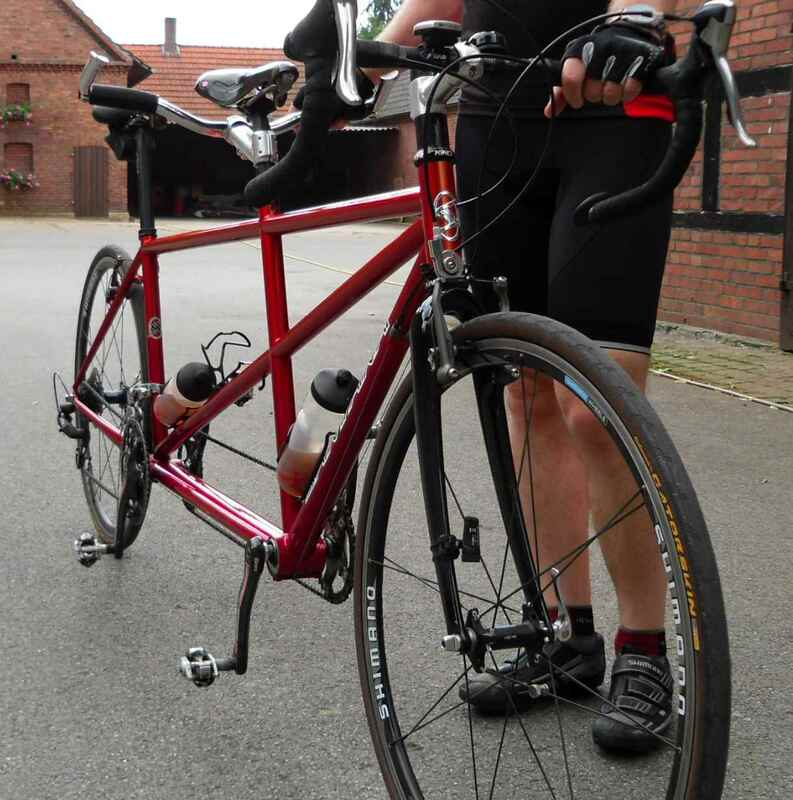 I had noted the two Lüders in the used bike stand of our village cycle dealer´s some weeks ago, brought there by the family of a deceased cyclist who bought them new in the late nineties. Never seen any in our nick of the woods, and now two. It never rains… Also our village cycle dealer doesn´t deal in racing bikes, so it was some find. There still were some problems about the sale of a new bike, but last Thursday I was able to buy the batch for a rather moderate sum. 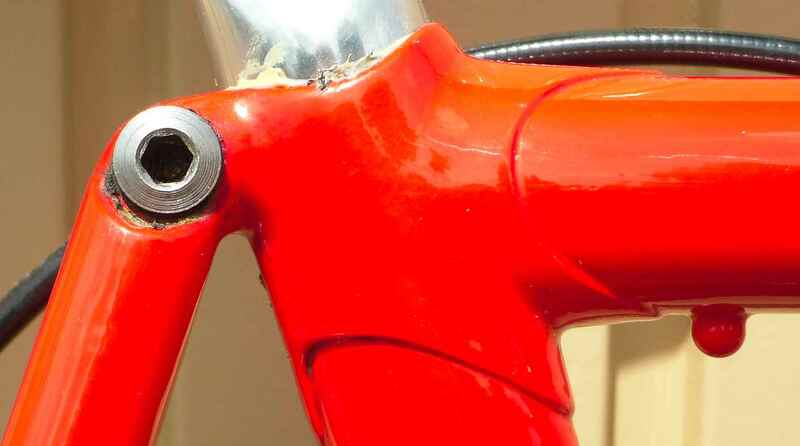 I will post extensively about one of the Lüders, equipped with a 9sp Record groupset, which I will repair after all and not part out as originally intended. The other one will definitively be broken for spares, reasons later. 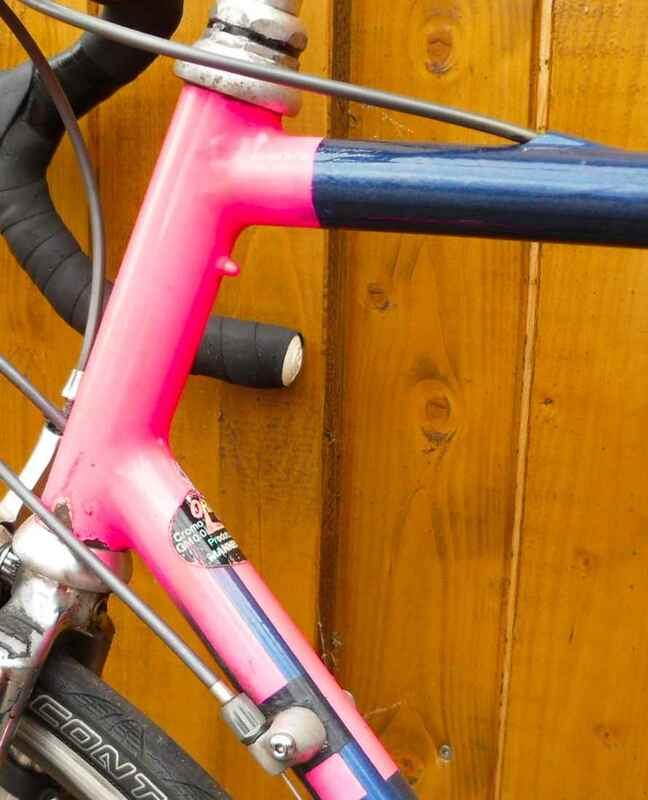 I had asked the cycle dealer expressedly not to repair anything on the three bikes to keep prices low, intending to break the bikes for spares, so he is in no way connected to any of the mechanical problems depicted in the following photos. In fact I´m grateful for him to have given me first refusal on the batch. I bought all three bikes as u/s and not roadworthy. Once a very nice bicycle indeed this Columbus had been butchered by the last owner and turned into something no longer resembling the thoroughbread it had once been, but also only vaguely reminding me of an able town bike. This is what should hold the luggage rack. A single finger had the rack sway by centimetres. 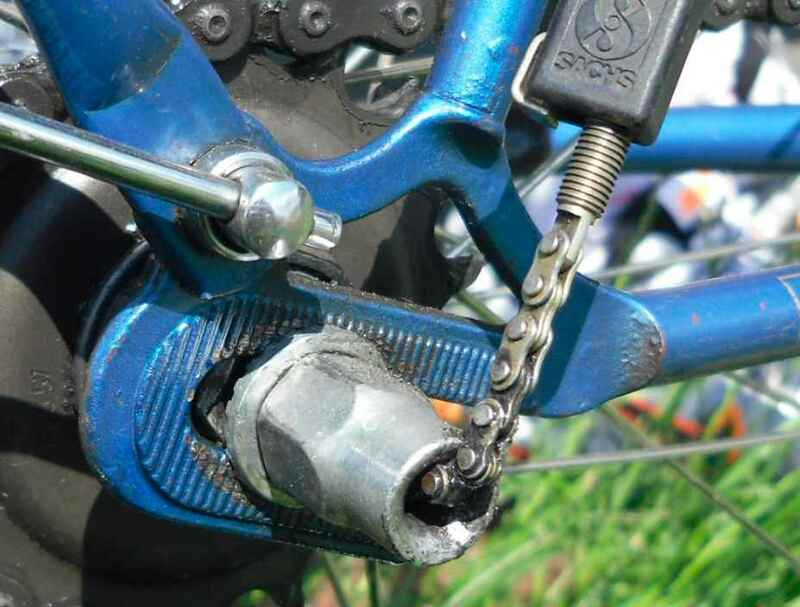 The dynamo clamp also had sagged and was touching the chain in sixth. But then look at these – beautiful. 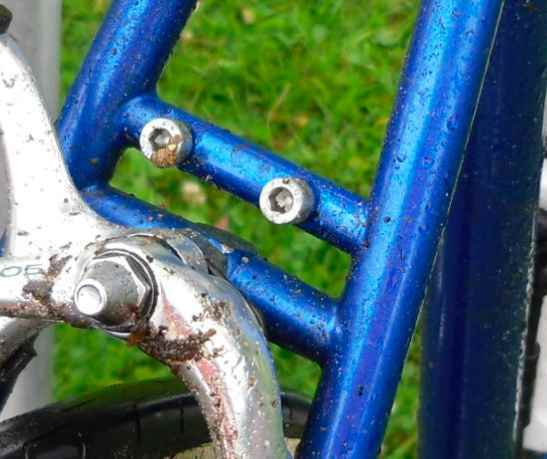 The thinned lug tip, the fork crown… When wheeling the bike to the car I noted that the headraces seemed strangely stuck, and upon disassembling them I found that they were just tightened right down to the end, not adjusted. Luckily the races survived the ordeal. Also the bottom bracket bearing had been assembled without grease. There was only some residual lubricant that had not been cleaned out. Again, the races were not great, but ok. No pitting in either case. My bikes never are too clean either, but I think this is way OTT. 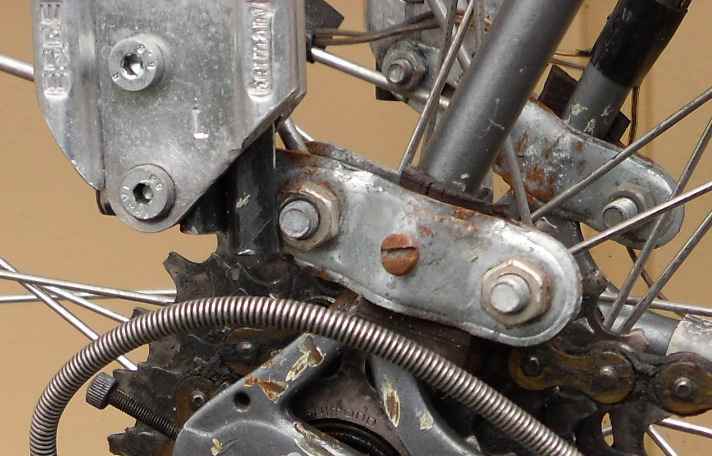 The derailleur didn´t work; some WD40 did the trick, though. 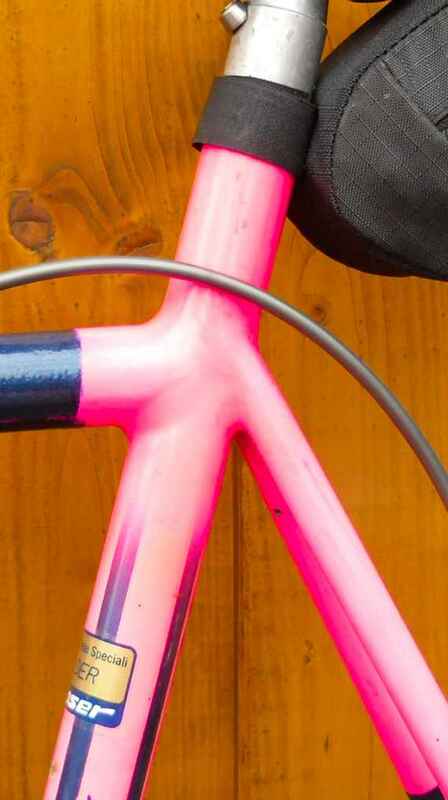 Another trick I need to remember: Use wide white plastic sticky tape liberally to tape lighting wires to frame tubes, then get spray can in frame colour and spray over sticky tape, cables and everything else in the vicinity. 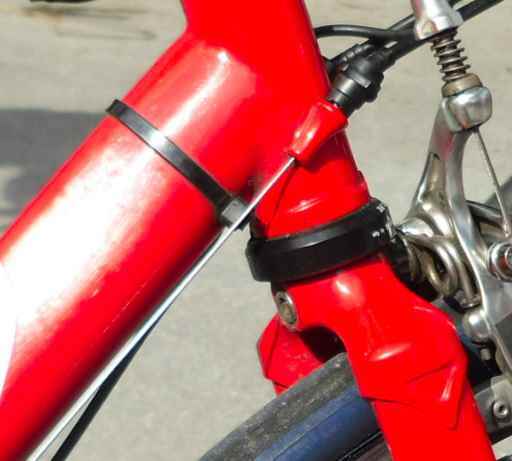 Paint will hold perfectly on frame, cables and a number of other things, even on chain – never mind it will come off the tape. 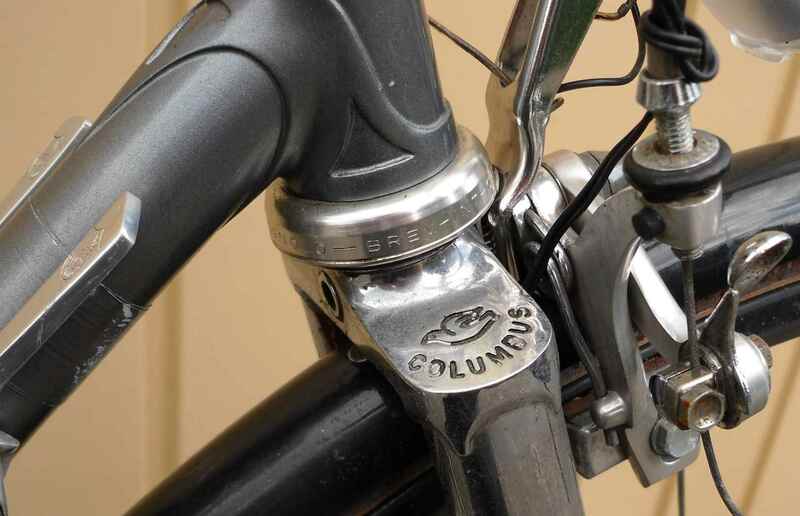 OTOH, I got a number of spares off the Columbus, the Superleggera pedals for instance going straight onto another bike, so all in all I got my money´s worth, if not more. Also the 8sp Athena suitable seatpin went onto my other Rickert as it still lacked one. Strangely the seatpin was 27.2mil – coming out of a Columbus tube I was able to reuse the pin in a 531 tubed frame. Again, I´m not complaining about anyone involved in the deal through which I acquired the bike; I´m just asking myself what went on in the last owner´s mind. But nihil nisi bene, and he´ll have had his reasons, so that´s that now. I somehow mislaid (or didn´t take?) the photos of the brakes, strangely modified. 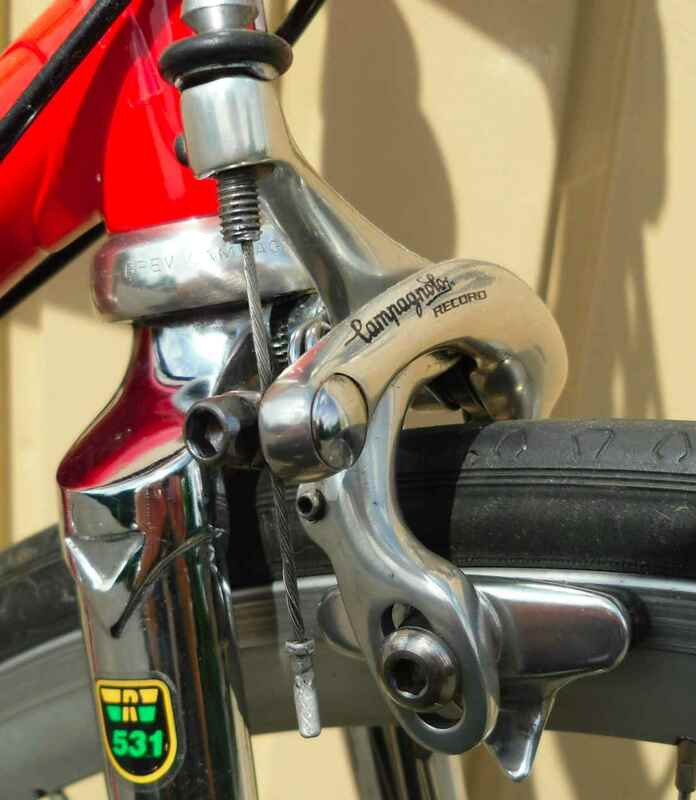 Both calipers and levers are versions I´ve not seen before, but then I´m not a Campag specialist. I´ll (re-) take the snaps and add them when I find the time. and where bakeries sponsoring cycling clubs are called Junkercalefeld (sounds like “Baron who owns a barren field”). Other typical names are Großekathöfer (“the farmer who lives in a big rented house) or Ottenottebrock (not the slightest idea). In short, the length of the names shows that life is like a quiet, slow river in Eastern Westphalia. Well, on sunny weekends, anyway. Unless of course you are involved with one of the global players which can be found in the area too (Dr. Oetker, Bertelsmann, Miele). Miele in special have had a history of innovation which is quite breathtaking, numbering bicycles among their long list of products. 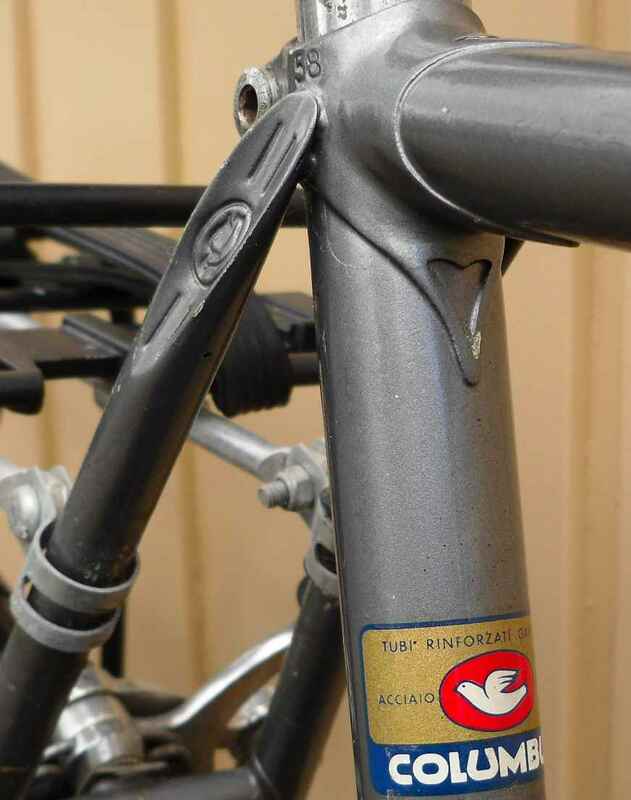 In the late twenties the firm took over a bicycle works in neighbouring Bielefeld, producing cycles until the early sixties. There still is a large group of dedicated followers, and they ride Miele bikes as if there were no tomorrow. 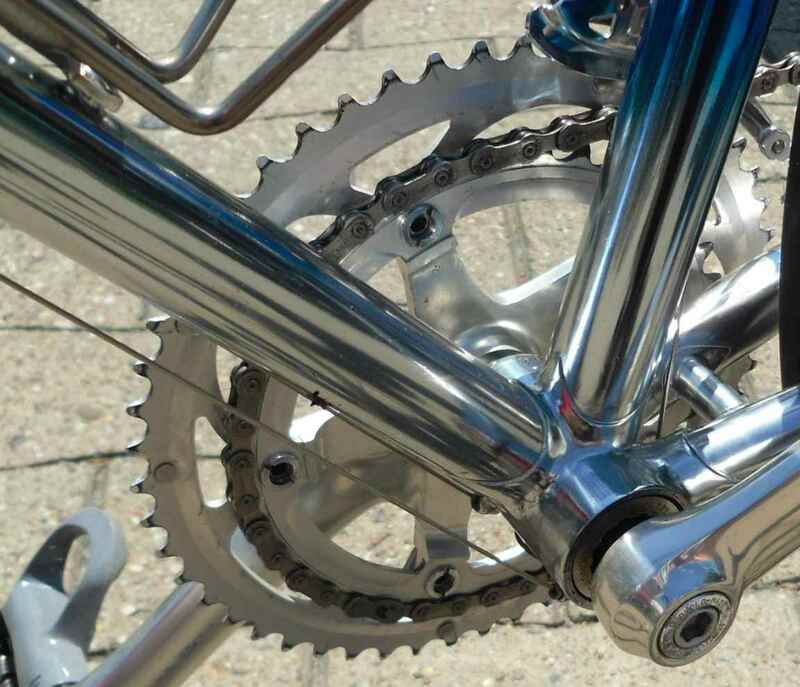 Using nothing more than three speed hubs, because that was the genral state of art in Germany at the time, they have conquered most of Europe´s famous rides. They even had jerseys made, all black, with a red “MIELE” on the back. One of them rode alongside us for a couple of miles until he zoomed off into the middle distance. Before that I was able to take a few quick snaps of his bike. The chainguard is missing from this bike, and it has some paintwork damage, but after fifty years plus of use, it´s pretty good. 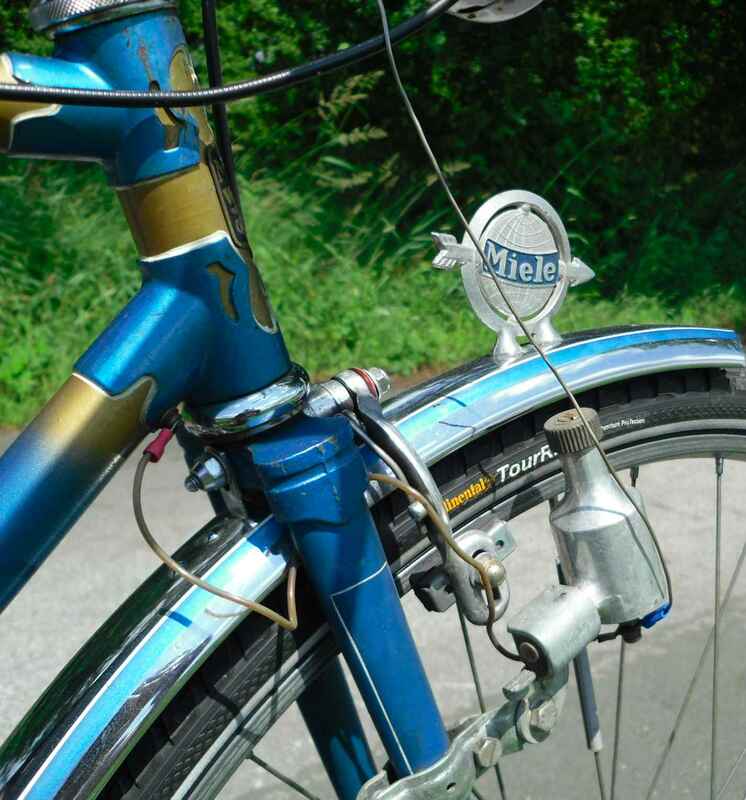 Some nice details here, like the mudguard embellishment, the typical Miele globe and arrow. The dynamo and lamp are Lohmann, of course Bielefeld made. 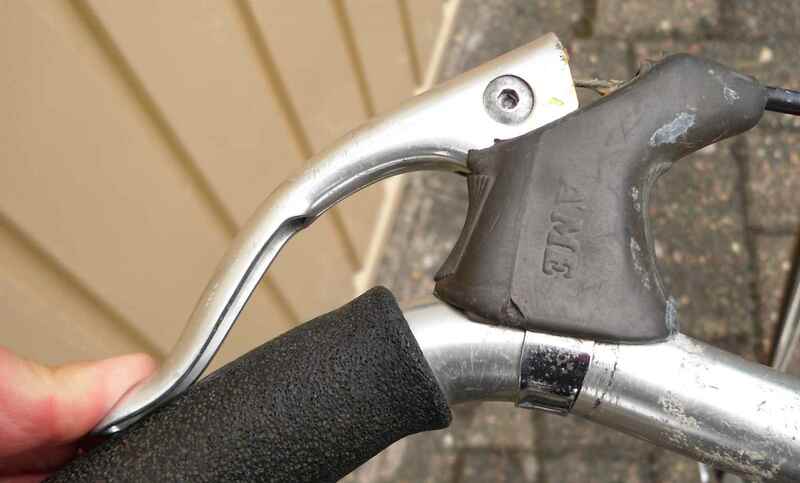 The clamp may well have been OEM, German manufacturers at the time not being very detail conscious. 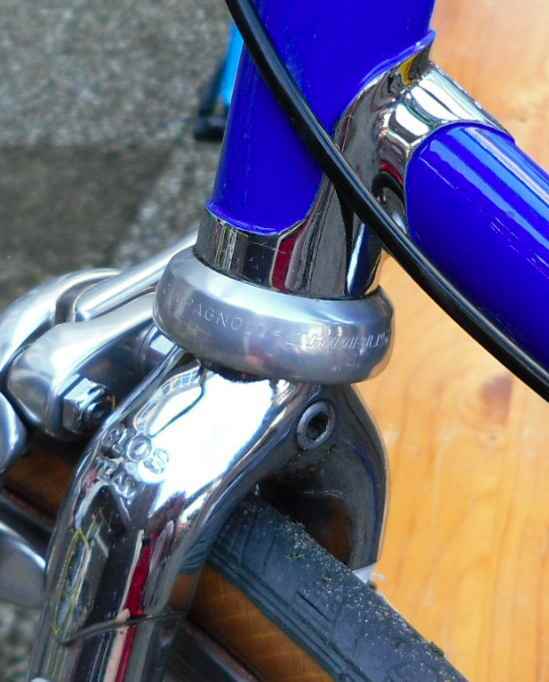 The rough look of the fork crown is explained by the fact that many bikes then had chrome plated hoods over the fork crowns covering such rough spots. Those hoods rust easily and often were discarded during an overhaul of the bike. 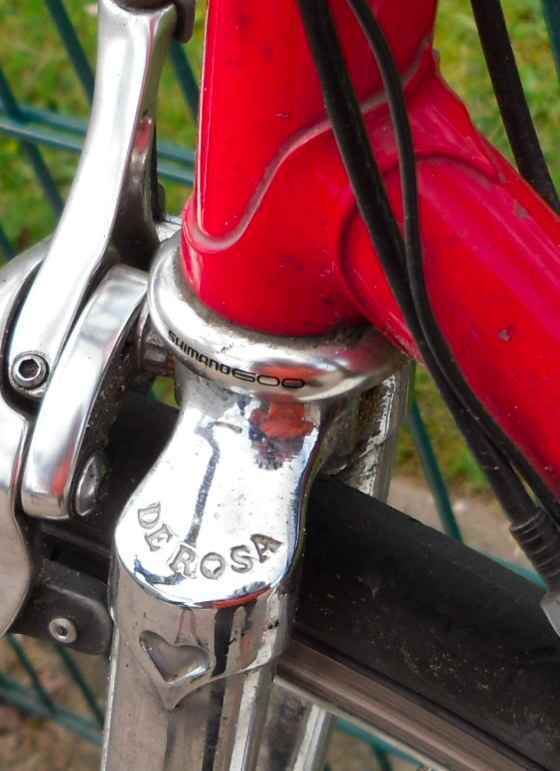 The chrome mudguards are of the rare narrow variety. 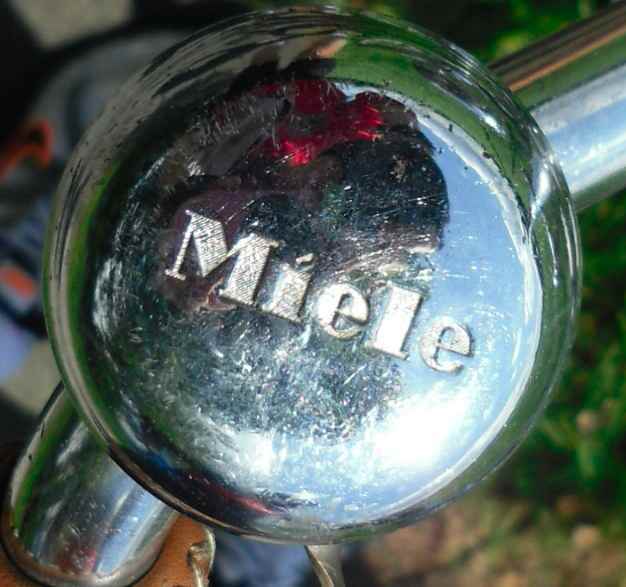 Here´s the special Miele sports bike headbadge. 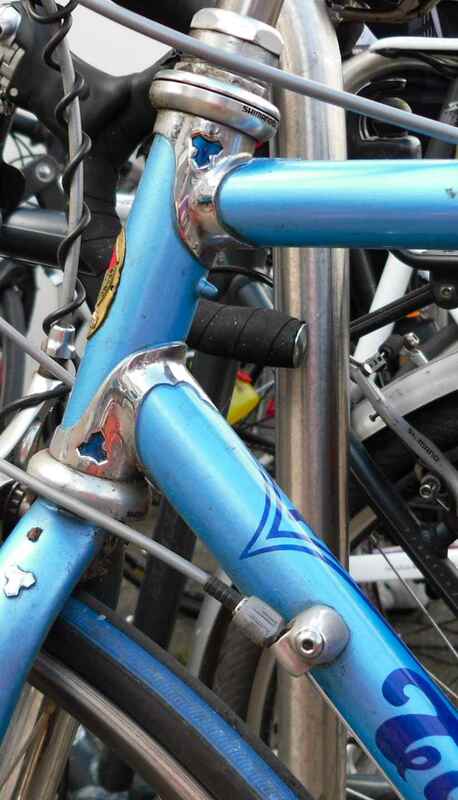 The standard, mostly black bicycles had different badges. 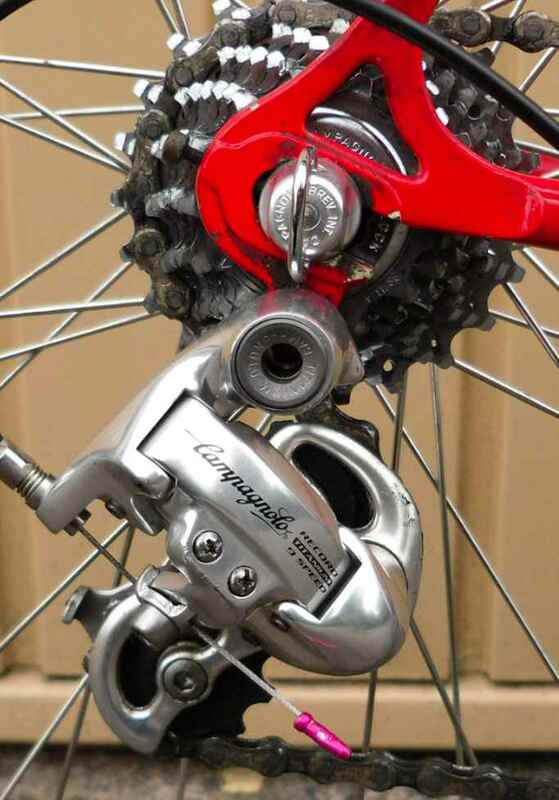 Also the lugs are a bit more special, but only a bit – on might remember that there were Nervex and Ekla and what not about at the time, so the lugs alone put this bike firmly in the middle price point and quality group. Tubing also was no name. 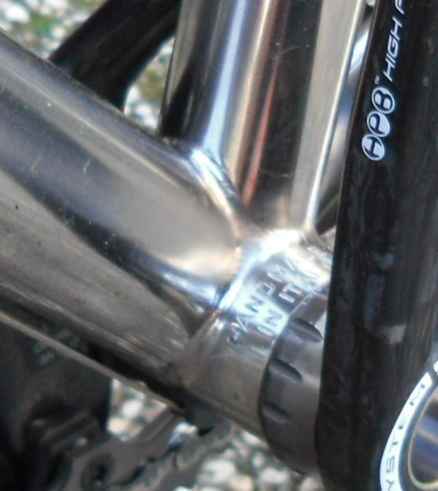 The bottom bracket area still shows some of the box lining. 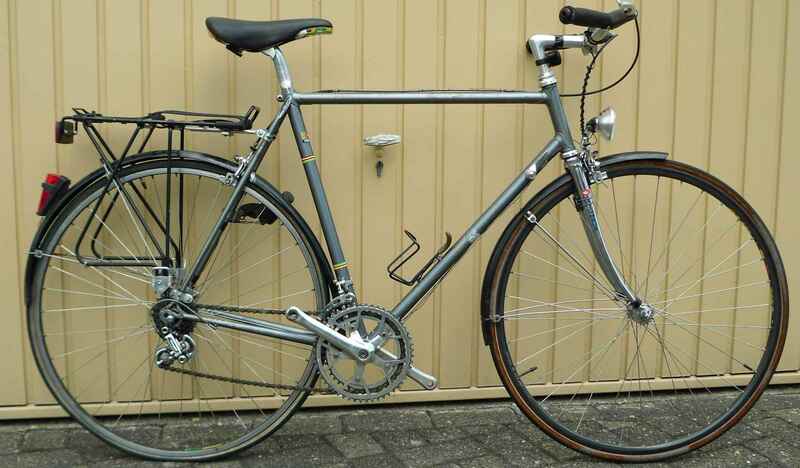 The complete bike used to be Bielefeld made, the crank set is, I believe, PWB. There is a small oiler on the b/b shell; at the time it was recommended that the bearings be oiled rather than greased. 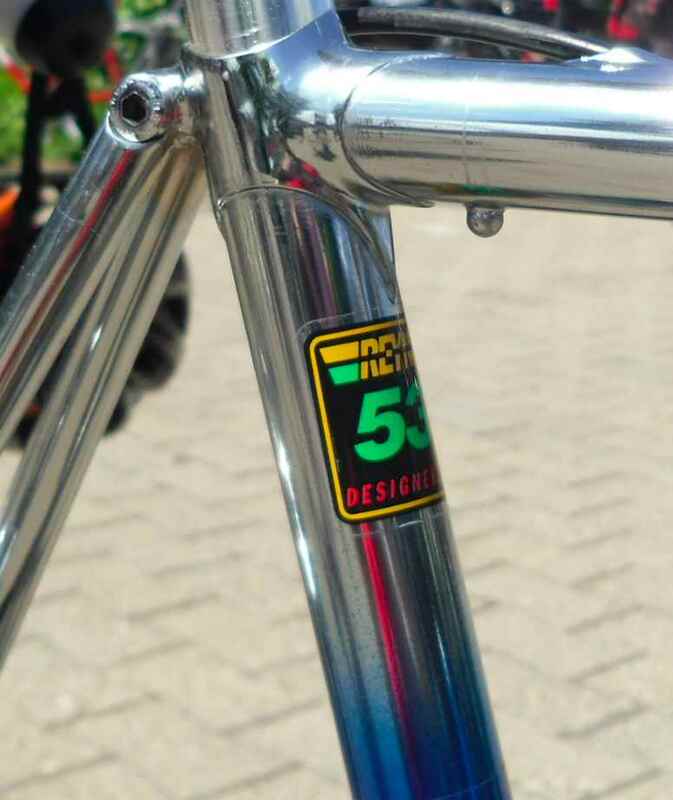 The fashion during the fifties in Germany was that the chainstays, sometimes also the seatstays, showed a ridge on the outside, clearly visible here and enhanced by a white line. Here they are again. 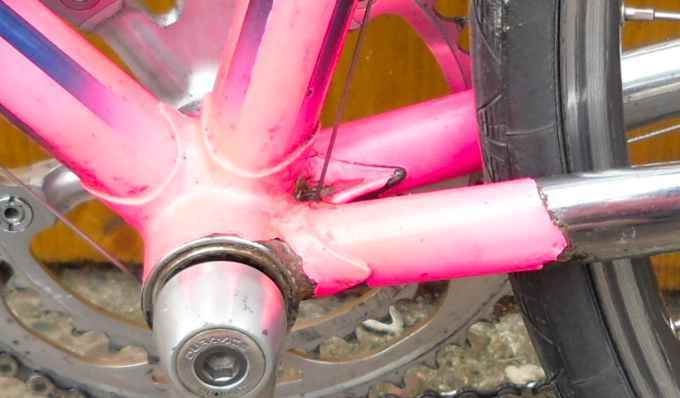 With the marked indentations on the inside to accomodate large tires, the stays don´t look very rugged to me, but watching the bike being ridden by a strong rider showed that there was no sway at all in the rear triangle. A chrome bell, regulation equipment in Germany since time immemorial, with the maker´s name, was de rigueur for a long time; private label bells are now a major collection field. The same goes for lamps, only that private label lamps were much rarer and only used by premium brands. The whole three speed actuating equipment is later and unoriginal. The dropouts are nicely done, drop forged, it seems, but the end of the luggage rack betrays the bike was made to a price point. The seat cluster also shows this. 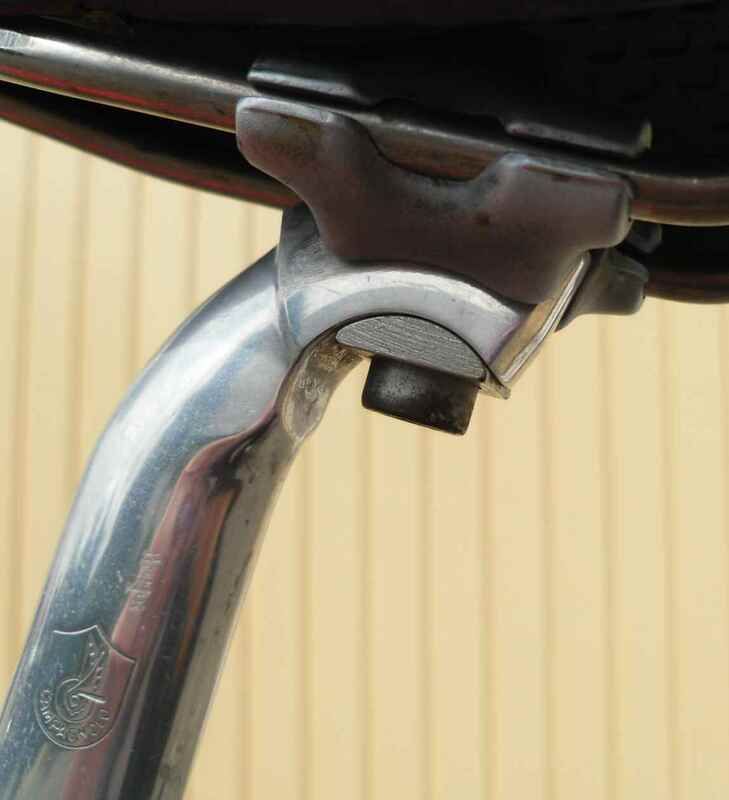 Some brazing residue is clearly visible on the lug just above the seat stay tips, the tube has most probably not been milled as the lug is long enough to accept a straight cut end and acts as a structural part – not exactly premium work. 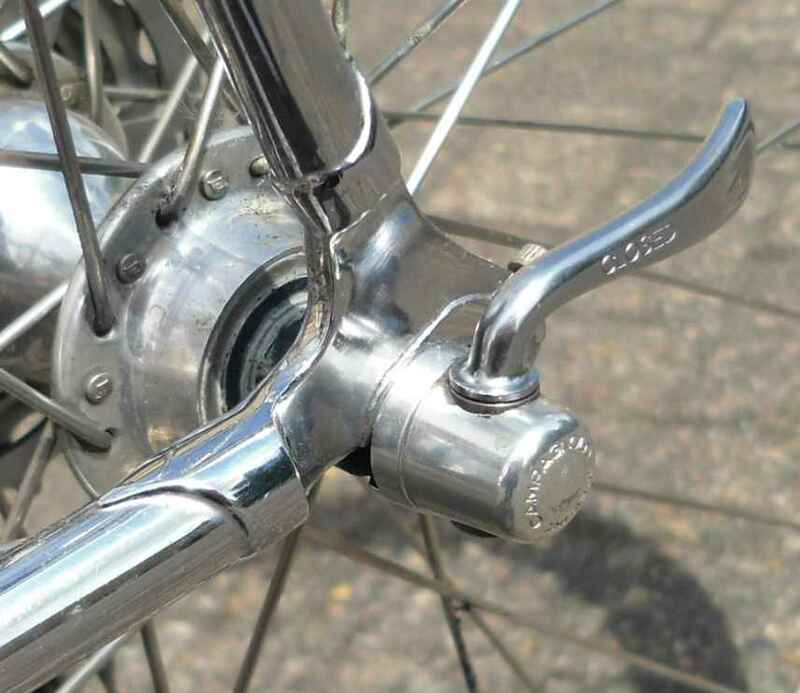 Also at the start there was an NSU cycle, 26×1.75 shod, on which the chrome fork crown hood is still visible. The mudguard embellishment shows the NSU flying tadpole which is not repeated on the headbadge. 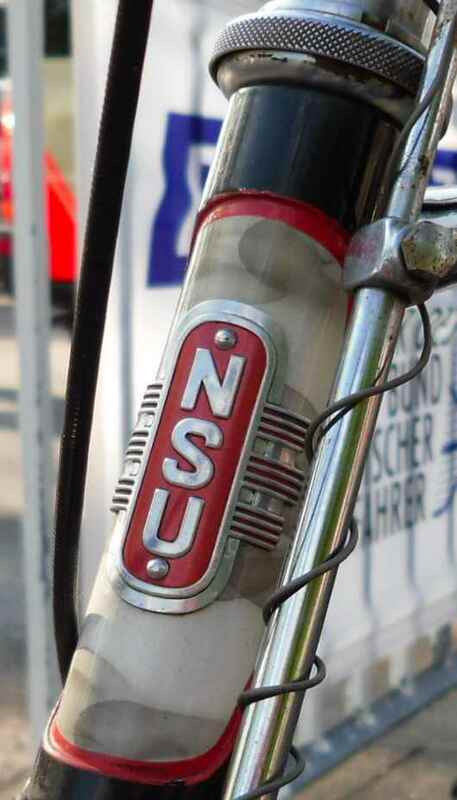 A great number of very well kept NSU bikes with 26 inch wheel still are around because the West Berlin government stored several thousand of them during the cold war to ascertain basic mobility of Berlin citizens should a new blockade happen. Those bikes were sold off sometime during the eighties, I think. 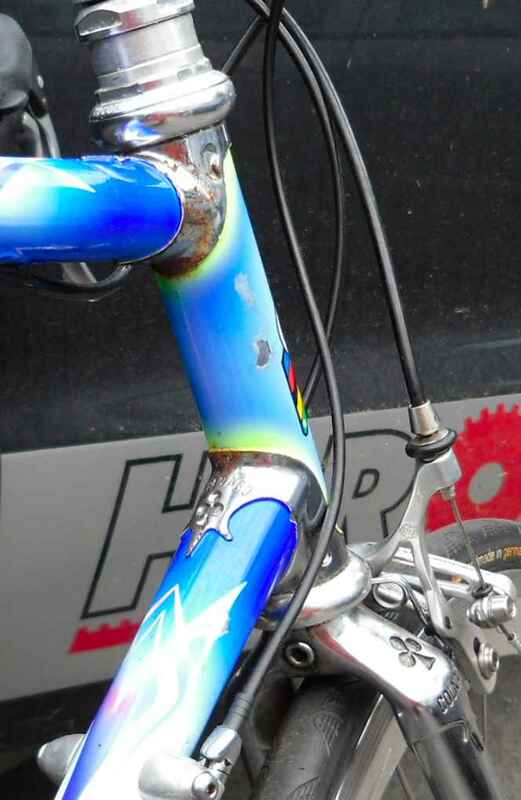 The headtube shows “geflammt”, literally flamed, paintwork: The grey shadowing really is clear coated candle soot. 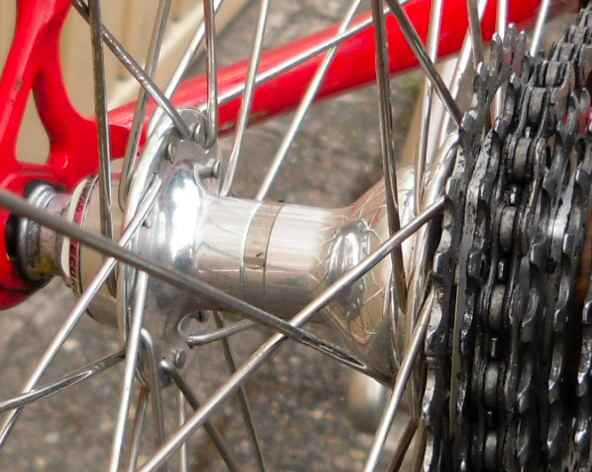 It was the fashion in the fifties to apply this to heatubes and rim and mudguard centres. But now some nicer steel; the usual crop. Not much comment necessary, I think. Is this a Bio Racer in disguise, I wonder? This is what we encountered on the way: St Vit abbey. It was one of those wonderful rides with everything perfect, the weather, the route, the people, the landscape, down to the food at the control posts. We took our time and covered the 113km in a bit over 4hrs 30mins, and enjoyed every second. But here´s some of the steel we saw. 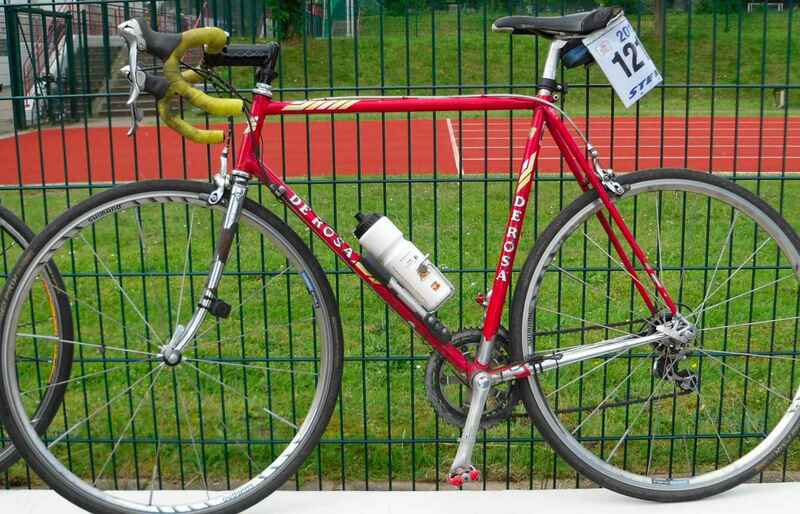 For instance this wonderful Colnago – lots of chrome, great lugs, but the Rickert topped them all. Fully plated, marvellous original paintwork and Björn, its owner, has promised to find the parts that are age appropriate. No more comment necessary. 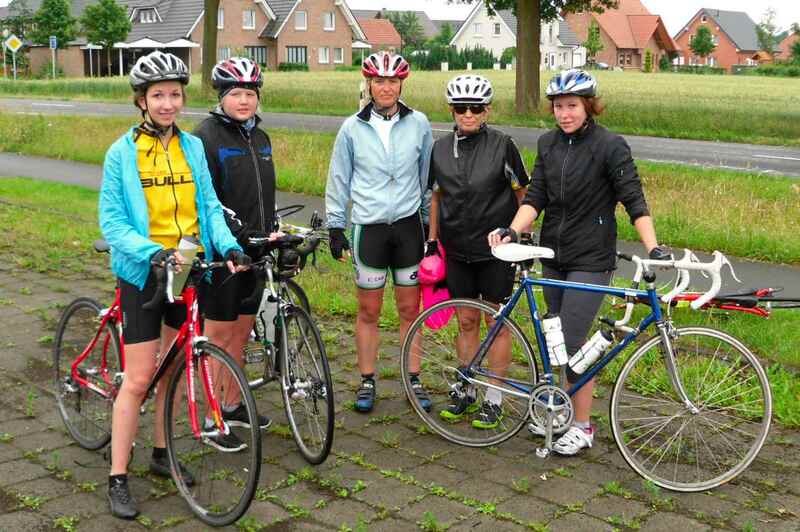 The weekend before there had been the annual Sprintax ride in Bielefeld. Bielefeld has a number of cycling clubs, perhaps this is still because the town was one of the two major German centres of bicycle production until the car boom in the early sixties. There were dozens of bicycle factories, among them famously Dürkopp who made absolutely everything themselves, excepting perhaps saddles, which came from a factory down the road, and tyres. Dürkopp bearings were famous for their precision and longevity, the works now having been taken over by Toyo now. Sprintax traditionally start their ride at the Bielefeld university campus which is a huge block of buildings purpose built in the seventies. They are sponsored by a big firm which makes hair shampoo, strangely enough. Here´s some of the steel from their ride. 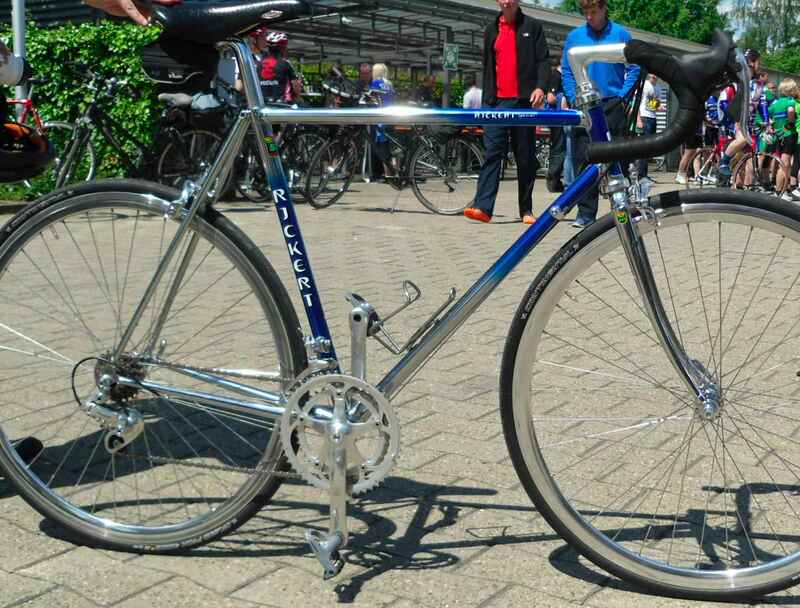 This is a Moser with a combination of lugless and lugged (bb) construction. Not sure about the paintwork, though. And two Tommasinis, only partially photographed because of the cramped space before the start. Lateron the bikes were gone with their riders probably a good few kph faster than I am. Planning to do a book review next, an early German training manual by one of the most controversial authors in the cycling field. Lots of people have been reading this blog which I find quite flattering, but I won´t succumb to any possible self built up pressure to publish more frequently than I have good ideas. I don´t know if this is a good idea, but I´ll post it, anyway. For posts like this I have added a new category called Tidbits. This is a record cover covering good old fashioned vinyl. Why it appears here is obvious, and I found the story behind it quite interesting. 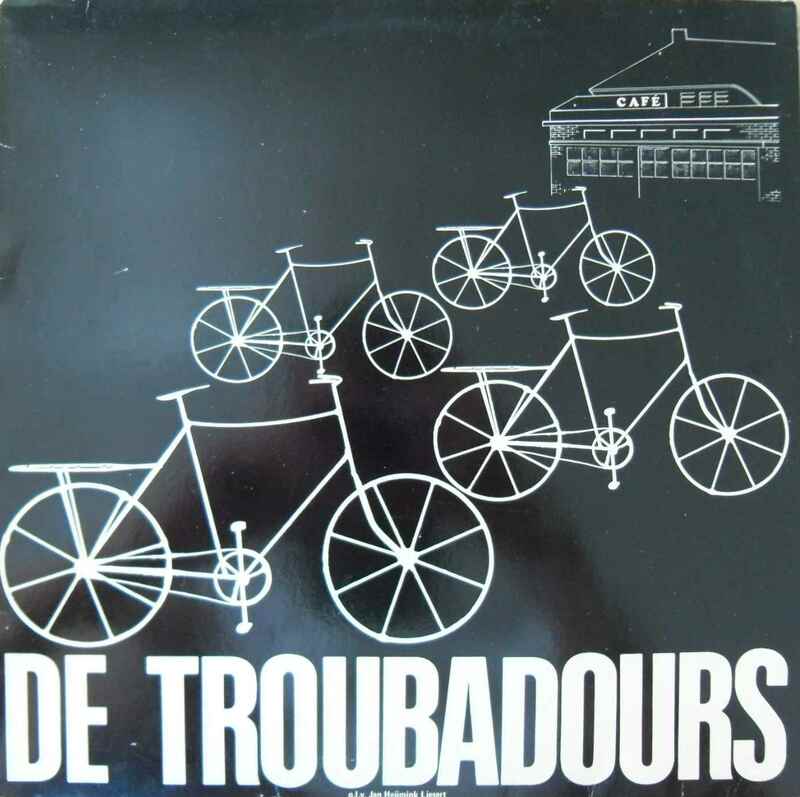 Inside the cover there is a printed explanatory note: The group “De Troubadours” was formed in the Netherlands in 1933, during the Great Depression, when four unemployed men got on their bikes and sang in Cafés in the Twente area. They were accepted by the public as one of the better choirs and kept on singing, employing more members, and still existed in 1981 when the record was pressed. And here´s the weirdest thing about it: I can´t tell you yet what the music sounds like because the hole in the middle of the record is too small for my record player. The record won´t go on until I´ll have drilled it out. It´s not my turntable which is to blame, all my other records fit, and it´s Swiss precision anyway. One last question: Is listening to, say, Leo Kottke on 1970s vinyl the musical equivalent to riding fixed? The feeling´s similar, anyway. After a great 108km ride this morning/afternoon I thought I wouldn´t bother readers with more riding photos, instead I remembered having an old racing programme stashed away somewhere. I managed to find it, and here we go. 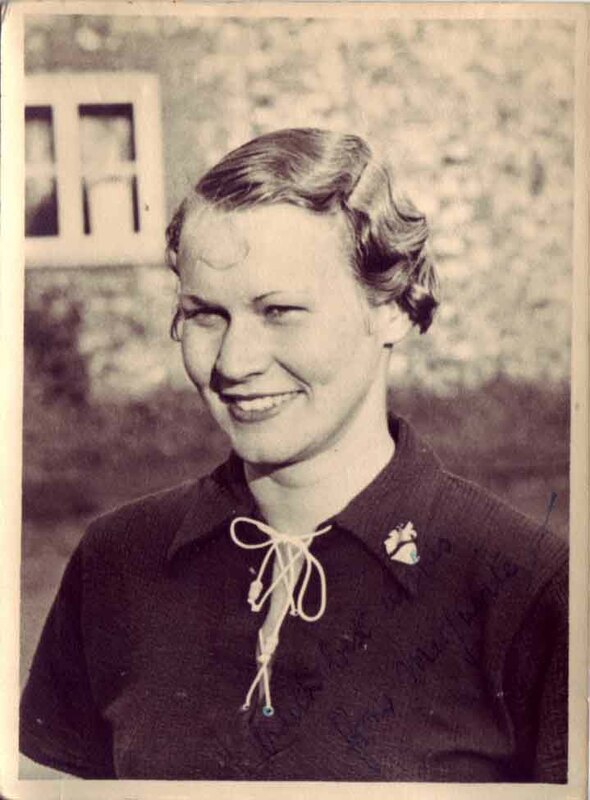 Marguerite Wilson was one of the three great women cyclists Britain can be proud of, the other two being Eileen Sheridan and the uncomparable Beryl Burton. Wilson has a wikipedia article, and two short films of her can be watched online in the WPA film library, so I won´t bother with biographical detail. 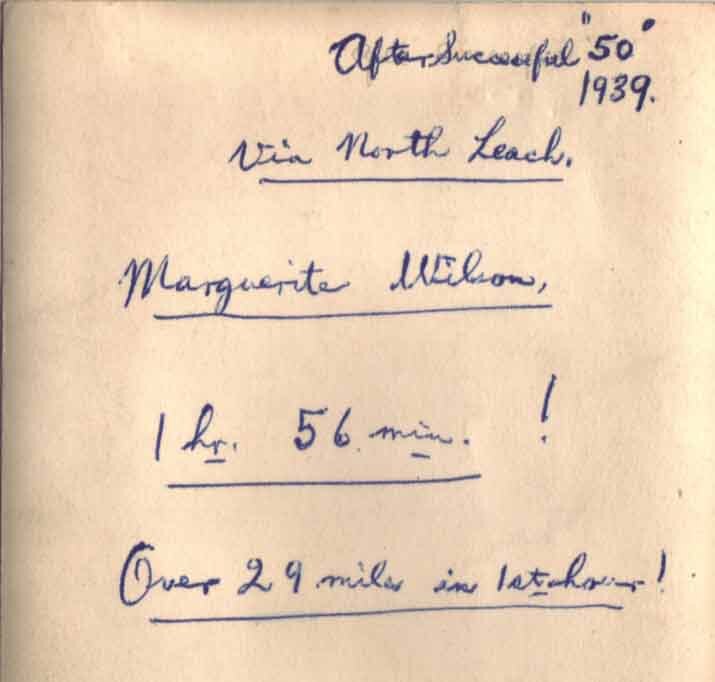 The first owner of the programme must have been a great fan of Marguerite Wilson´s (as is the writer of these lines). The programme hasn´t very many pages, still he noted where he could find the article on Wilson. Perhaps not so much a man of the pen as a man of the spoke. The programme of course also contains a number of great and not so great advertisements. So, to heighten suspense, here´s one with a Beeston Humber cycle, and all of it more than half a year into World War II, remember. 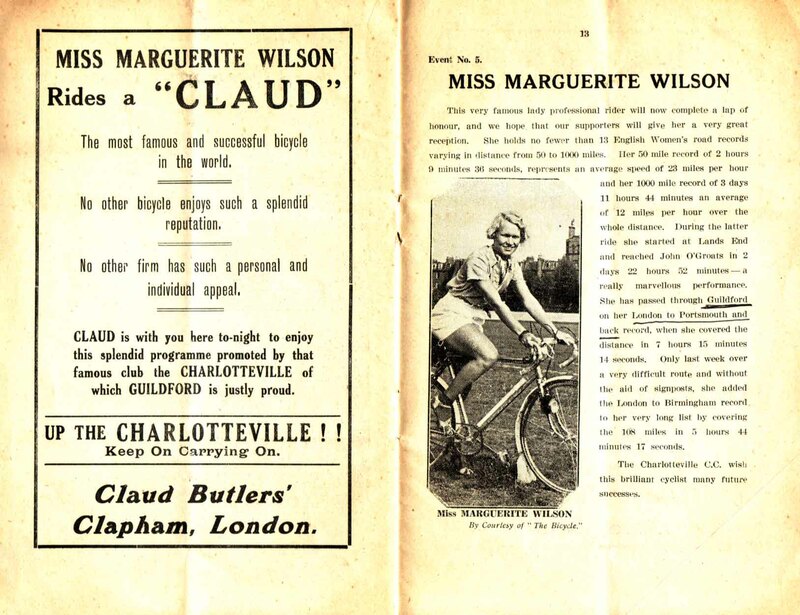 The short description of Marguerite Wilson´s appearance at Guildford – no racing, just lapping honour. So now we know that she had a quiet day on June 19th, 1940. Quite an exploit. I really don´t care to find out how many kilometers 29 miles are, it would probably give me the creeps. 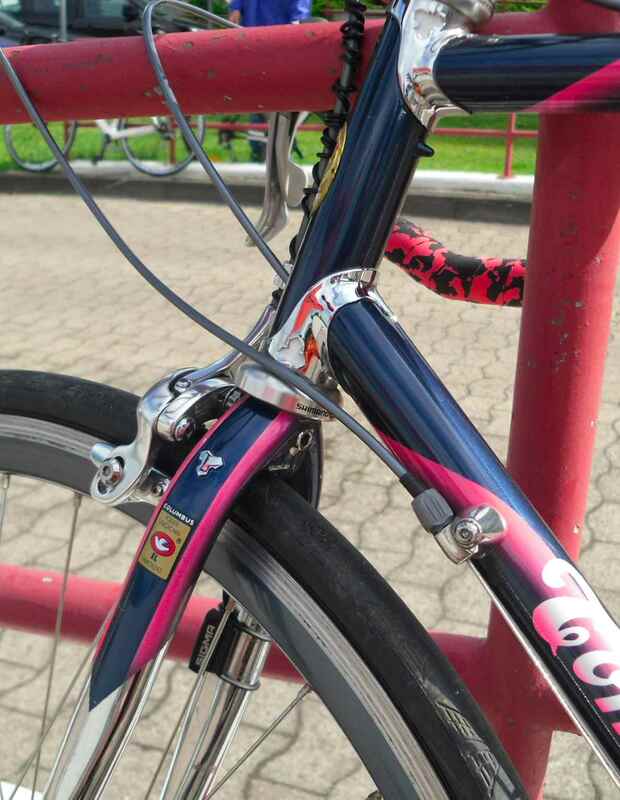 This snap is really wonderful as you can see many details of her bicycle. If we believe what it says on p. 12 of the programme, it must be a Claud Butler. 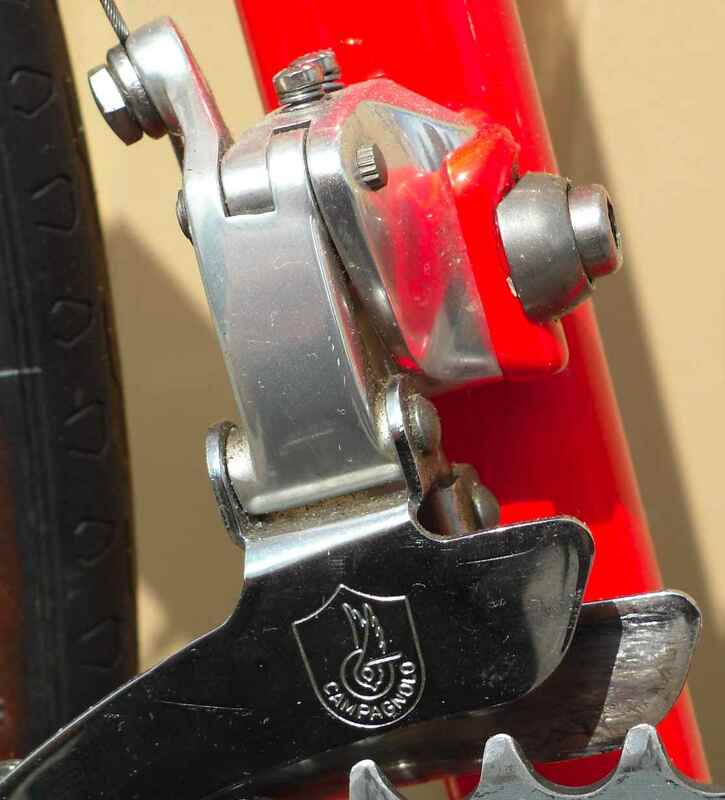 It could well be as Butler was a great supporter of derailleur geared cycles, and this one proudly sports a Cyclo gear. 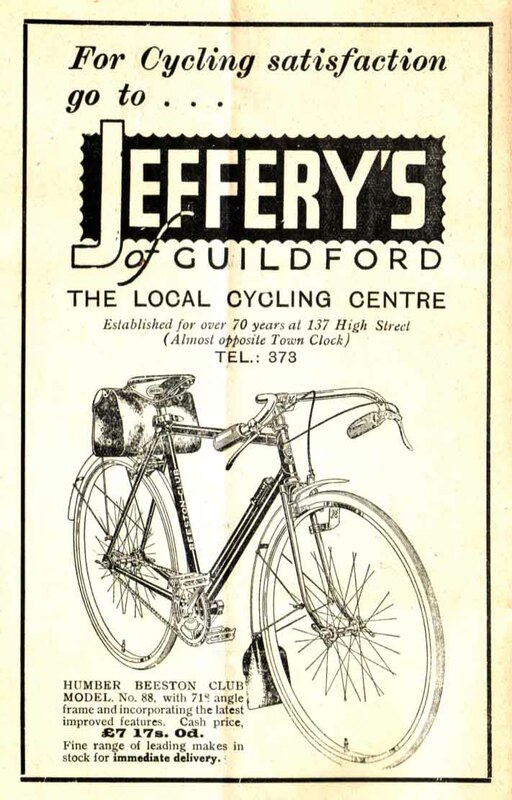 Cyclo, originally French, had opened a dependency in Britain so an all British version was available at the time. 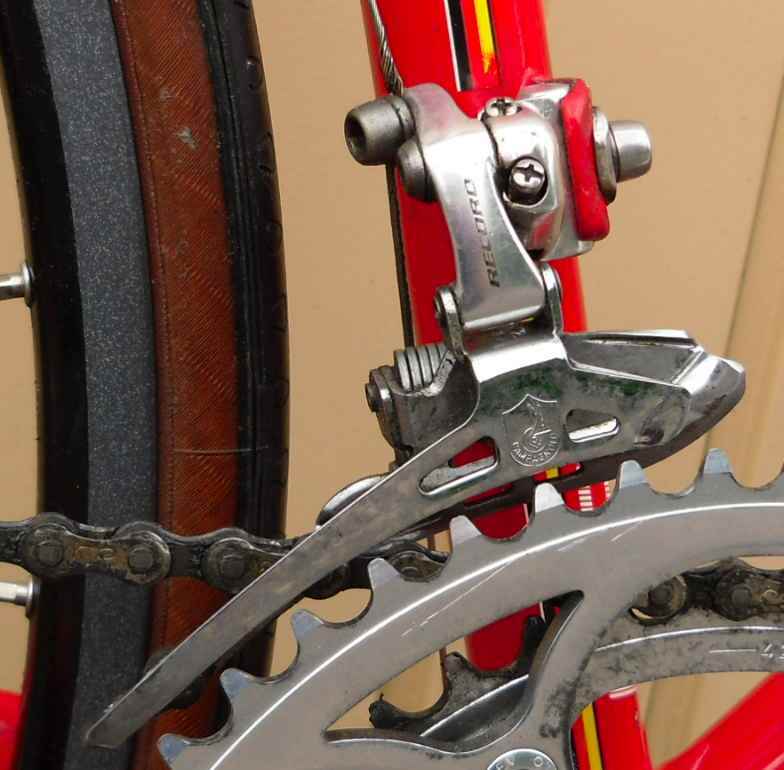 The next thing you can see clearly are the Resilion Cantilever brakes, a very British affair. 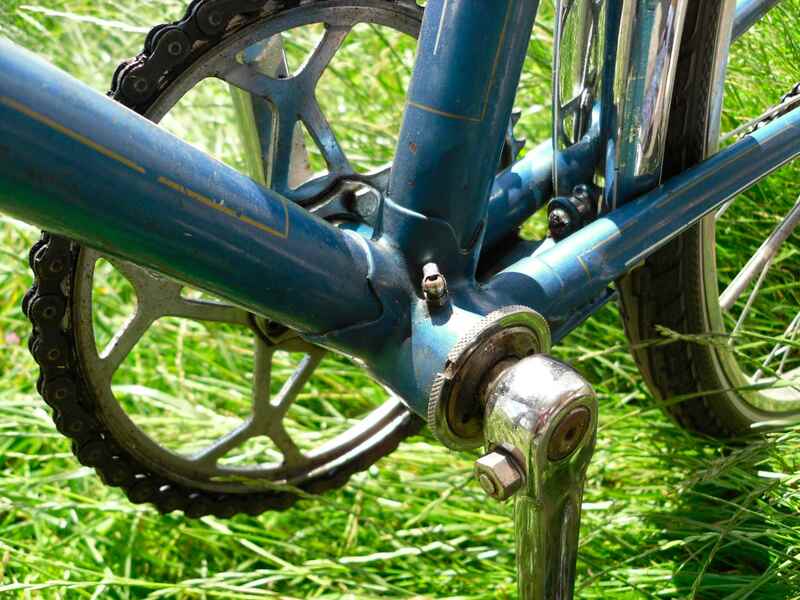 Effective enough, they were beasts to set up – I have two bikes equipped with them. Spares are hard to come by today, especially brake blocks. 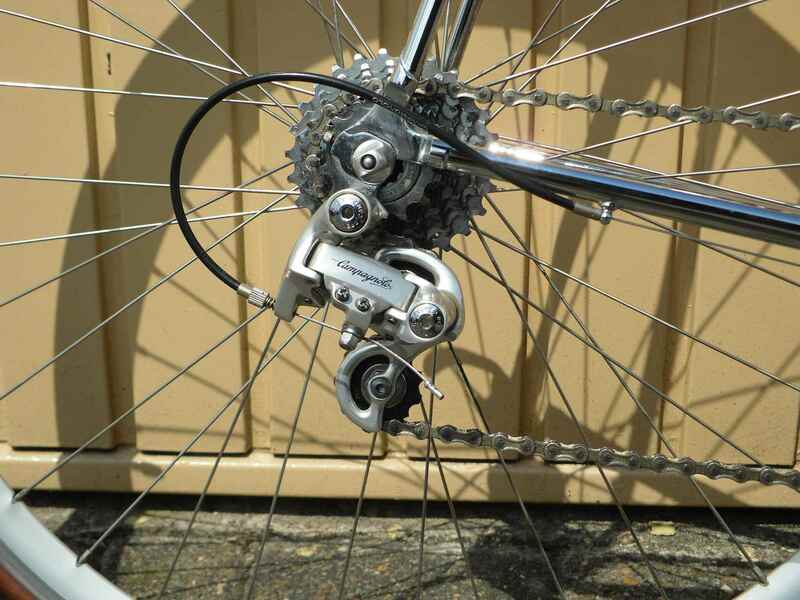 Wilson´s crank set seems to be a lowly cottered, steel Williams 34, judging from chainwheel “design”. 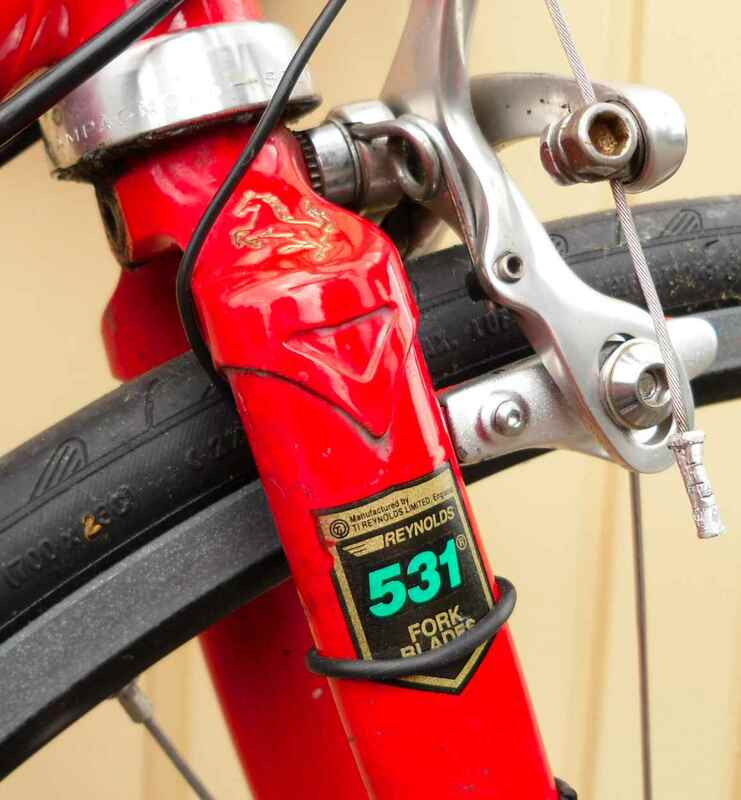 Looking at old catalogues you will be able to see that 34s were widely used, despite the fact the the French had been using Stronglight square taper axle alloy cranksets for years. 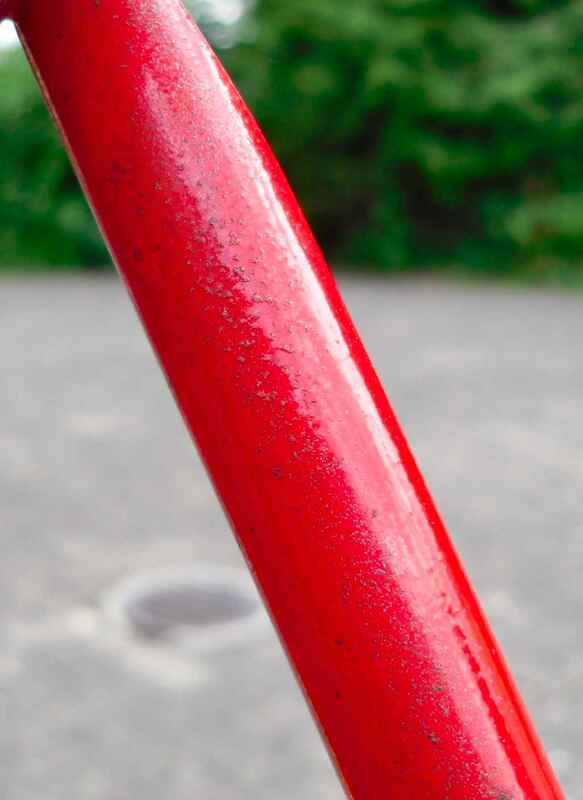 I can´t see if she still used wood rims, they would have been outdated in 1939, but is there an alloy sparkle anywhere? 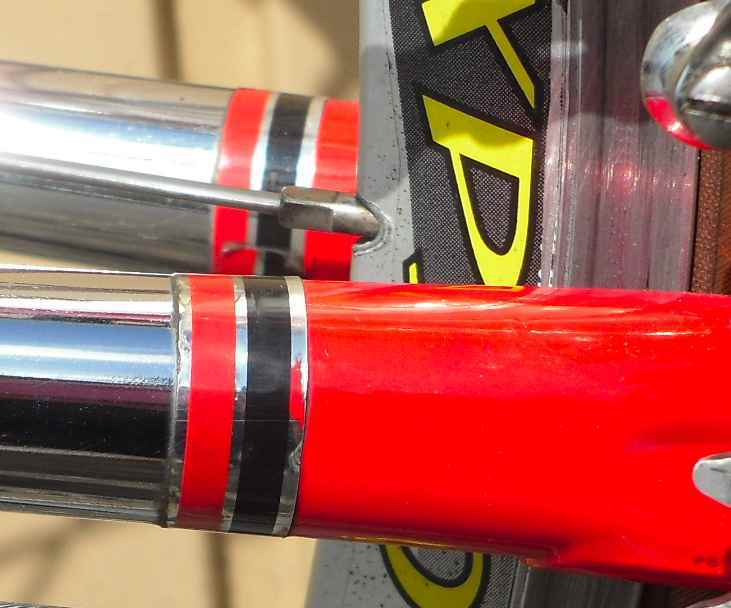 There definitively is a lamp bracket on Wilson´s bike´s front fork. It seems a bit bent to me. 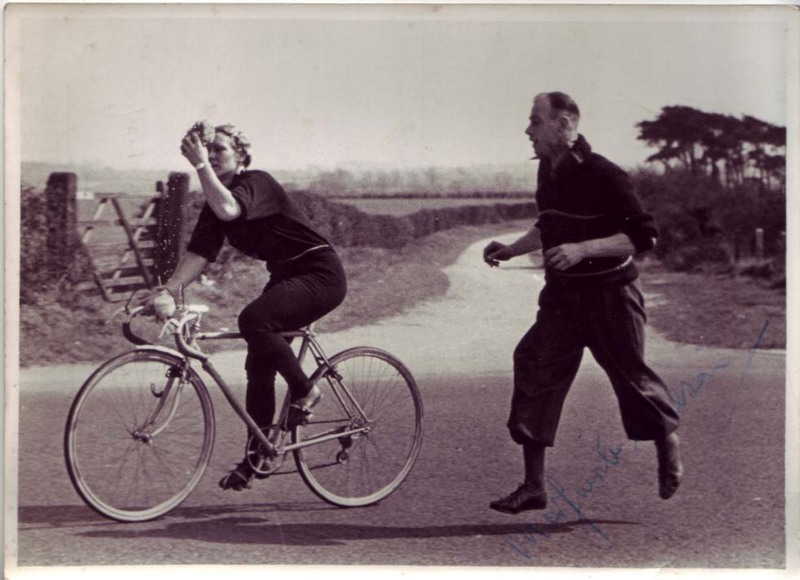 Also note the feeder bottles on the handlebars, very common in the thirties. 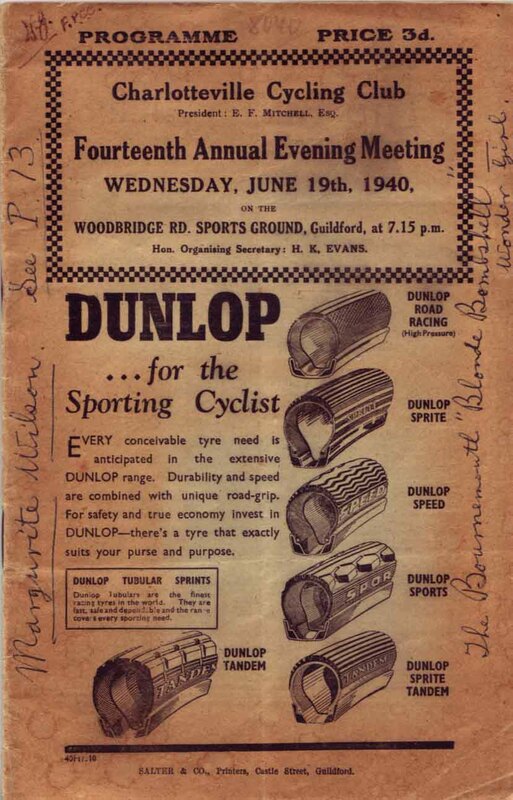 The Monckton was another cycling club, and with that vital piece of info I´ll sign off for today. Several days, possibly, will be sidetracked by having to earn some money.